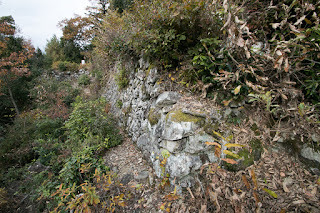 Iwao castle (岩尾城) is located at the park of Jyayama mountain, one of 250 meter height from hillside in Yamanami area, where is southwest edge of Hikami basin. 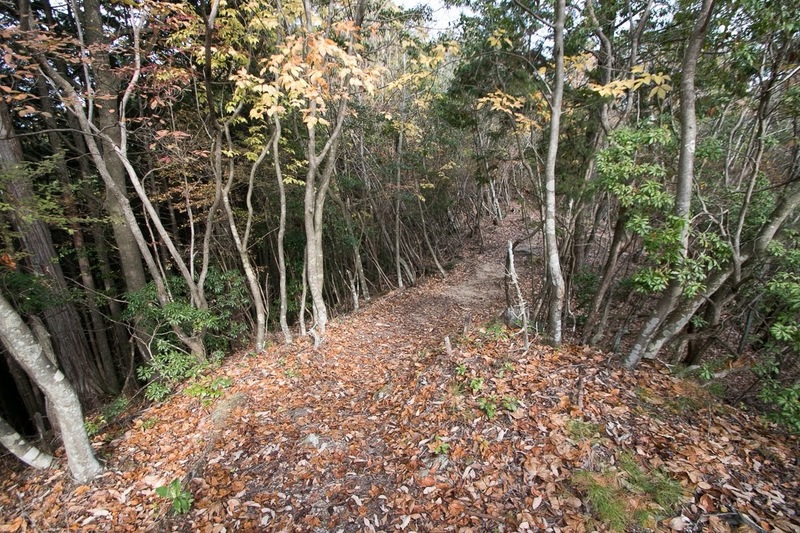 Hikami basin is a corridor formed by two rivers, that mean Kako-gawa river which flows southward to Seto-Naikai sea, and Takeda-gawa river which is a tributary of Yura-gawa river flows northward to the Sea of Japan. 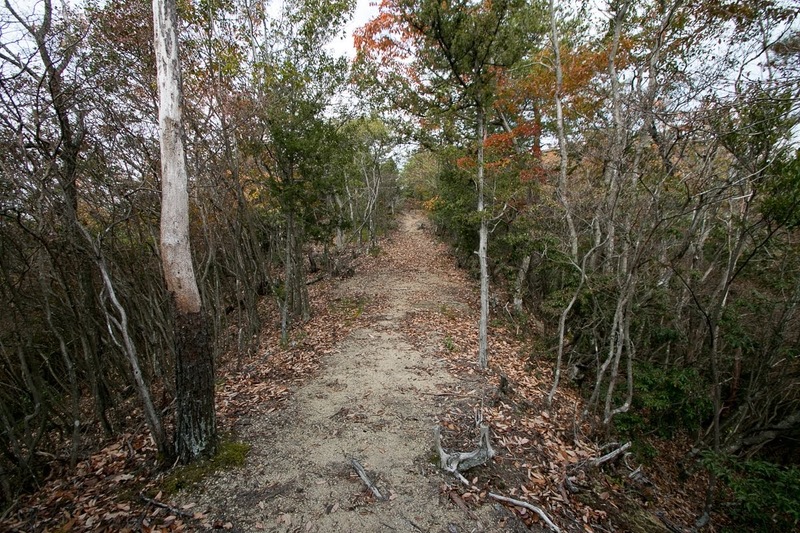 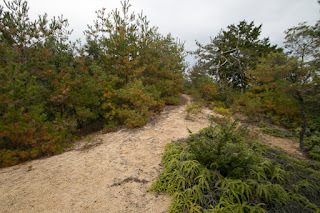 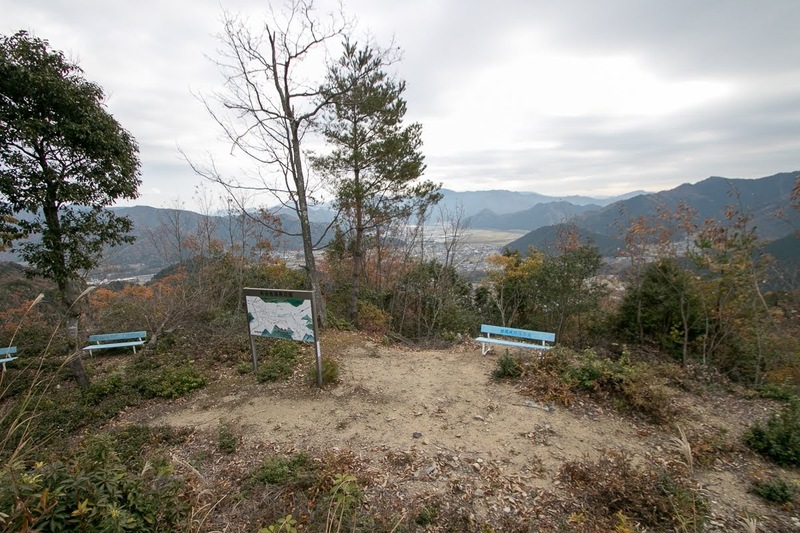 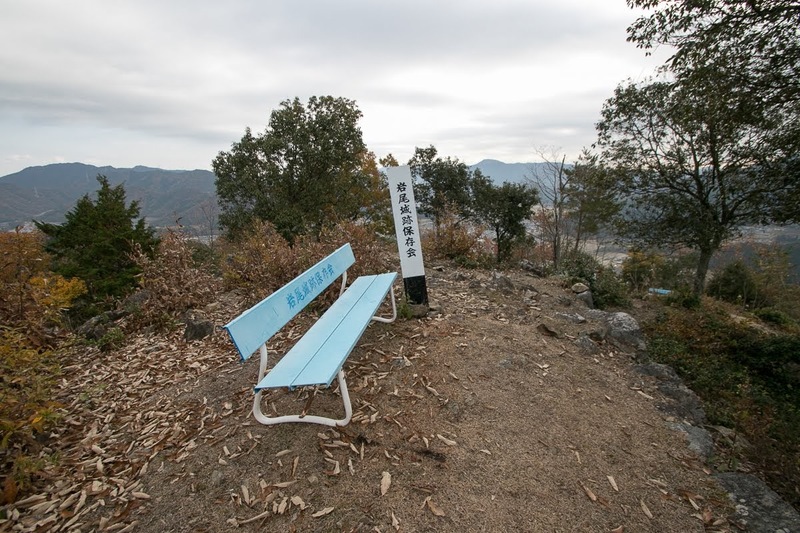 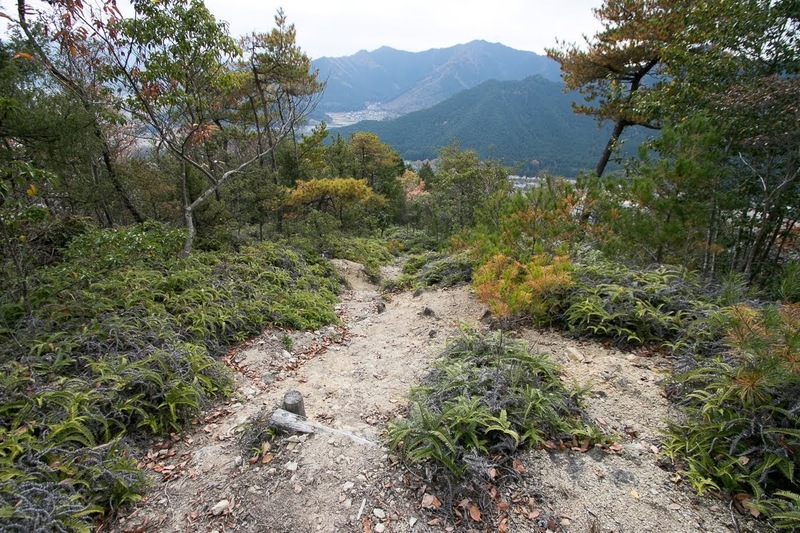 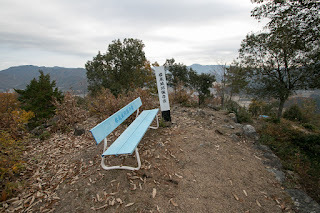 Hikami basin is a small mountainous basin but is the lowest watershed which separate Sanyo region and Sanin region, where is possible to connect both side without any pass or tunnels, and now remains as Route 175. 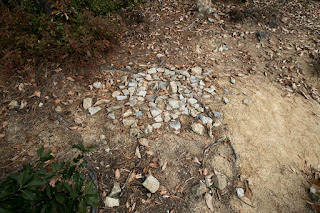 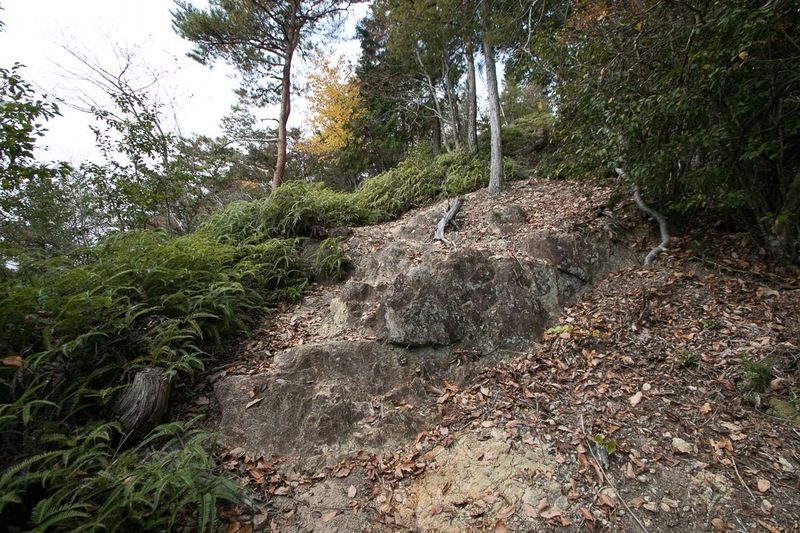 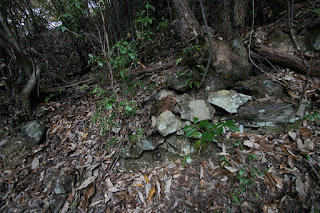 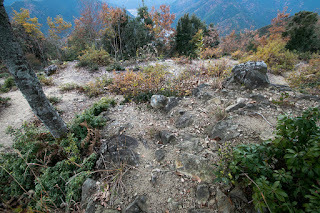 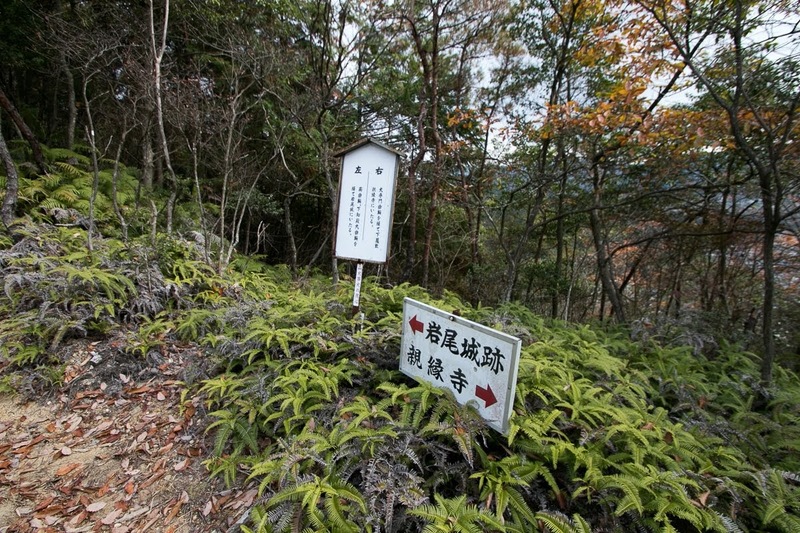 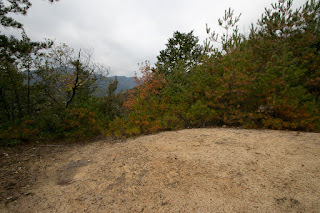 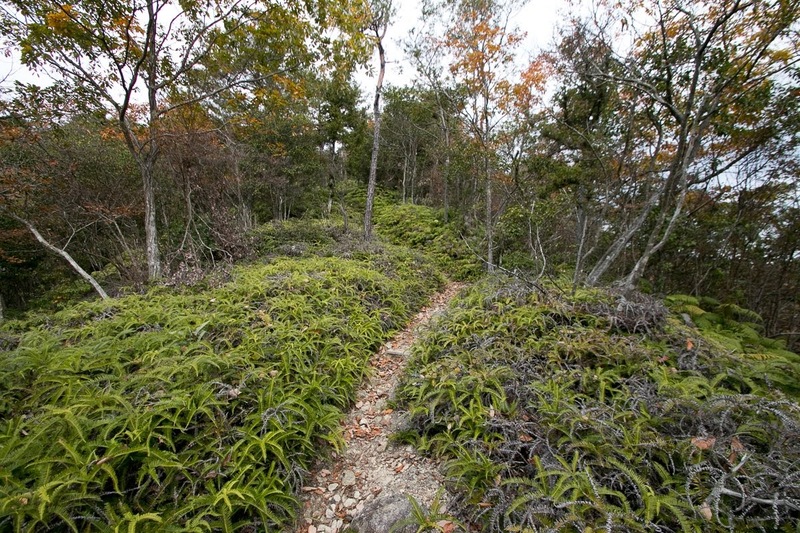 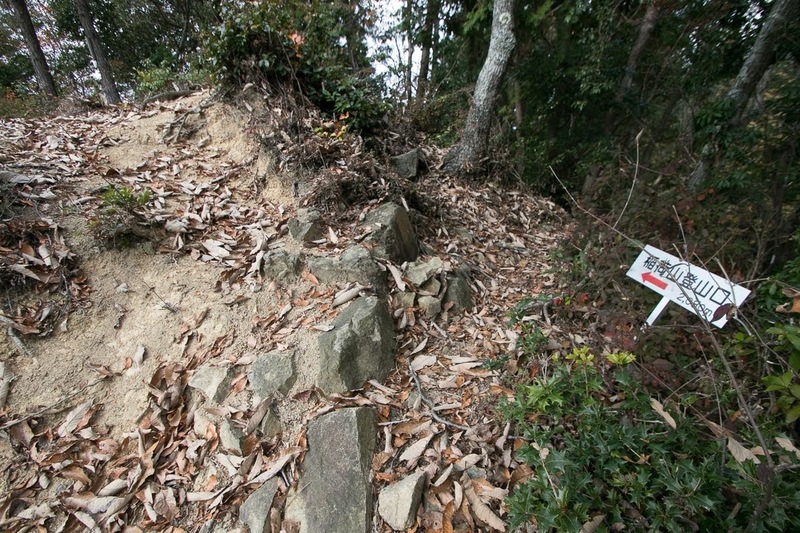 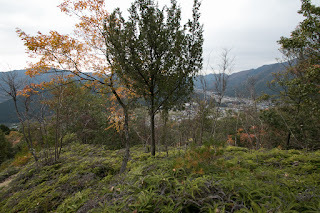 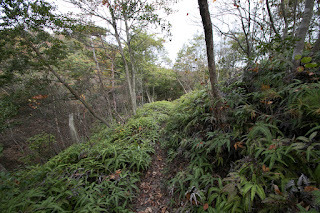 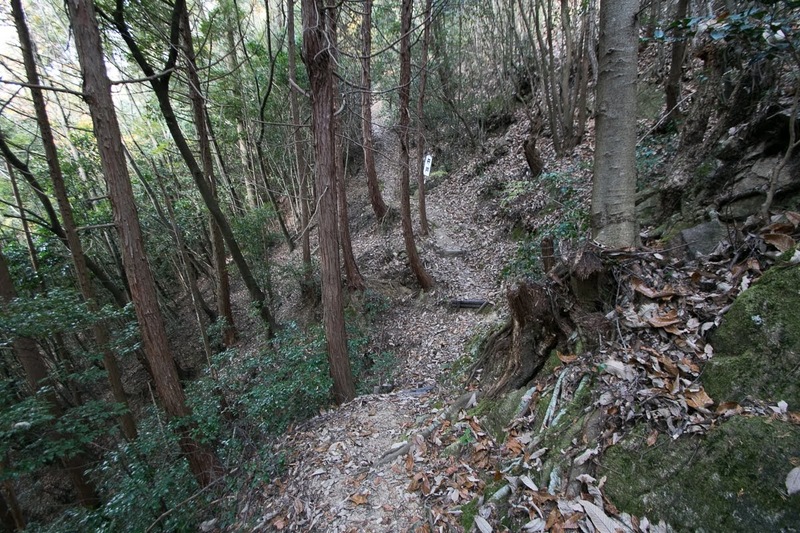 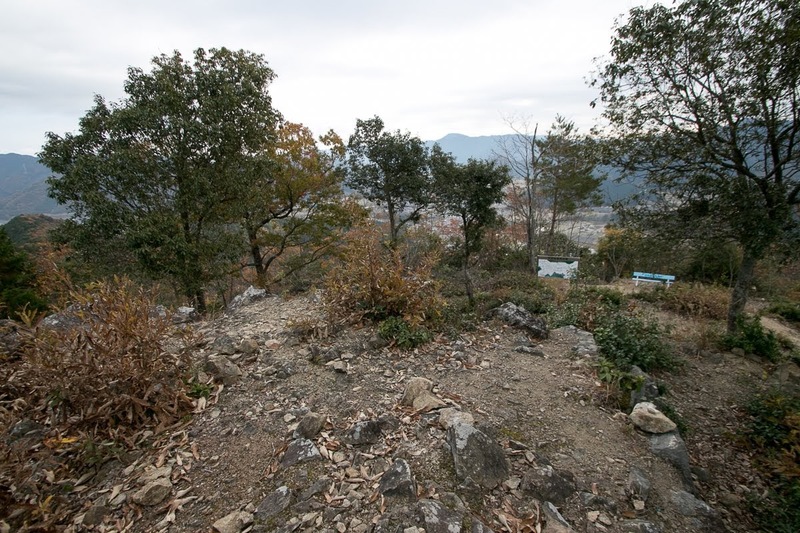 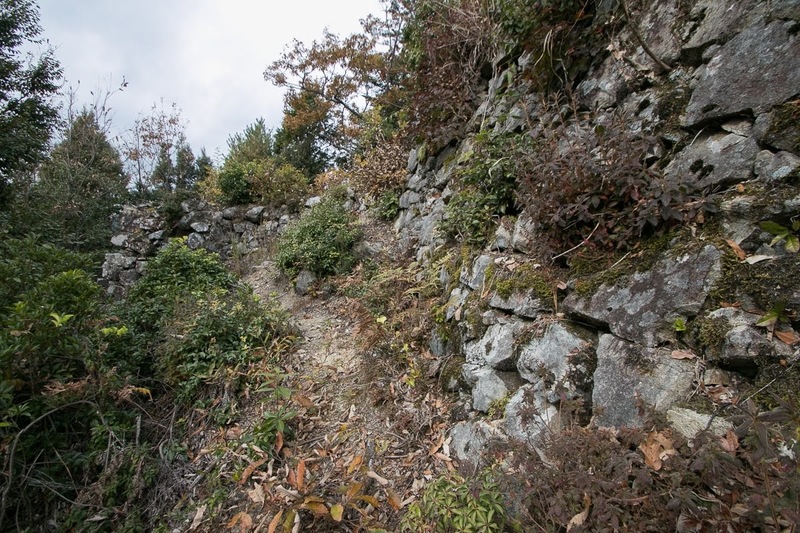 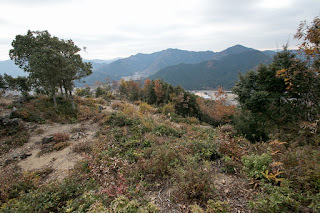 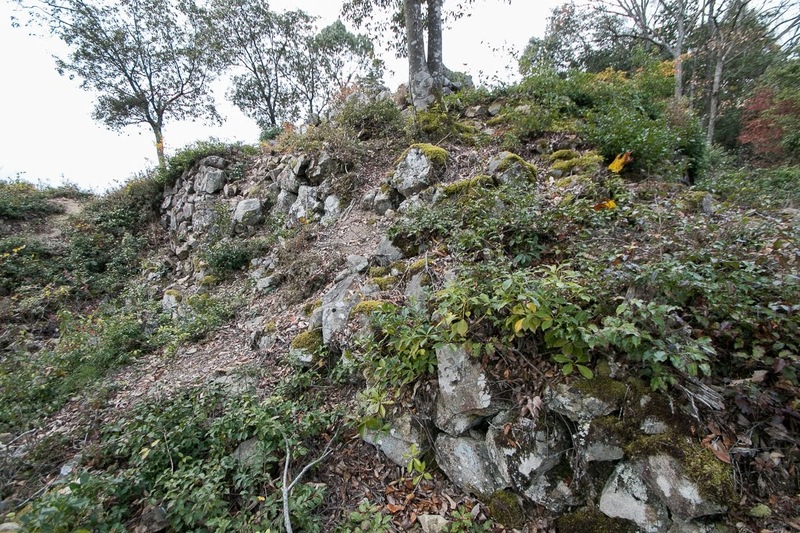 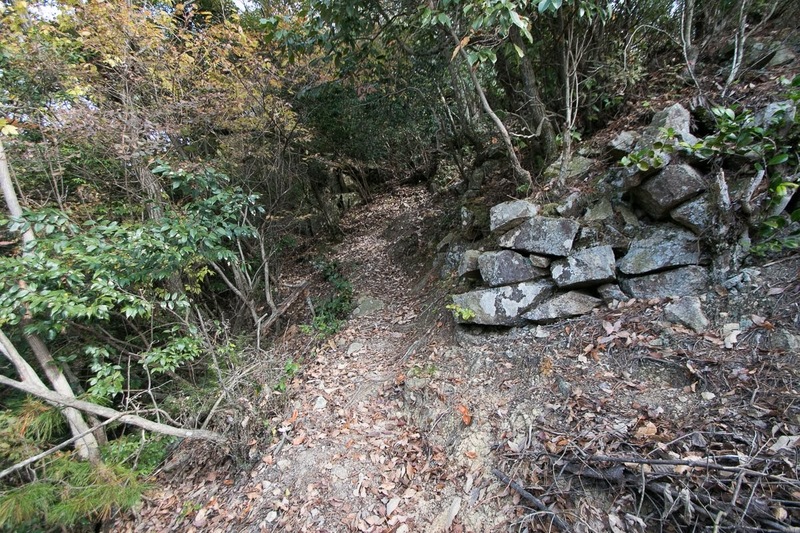 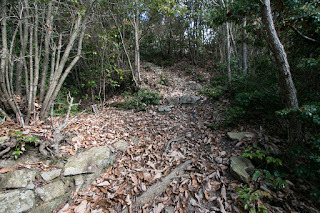 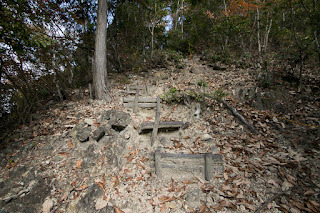 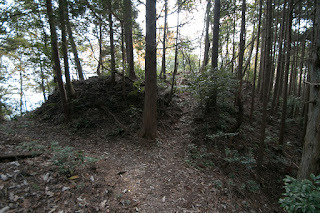 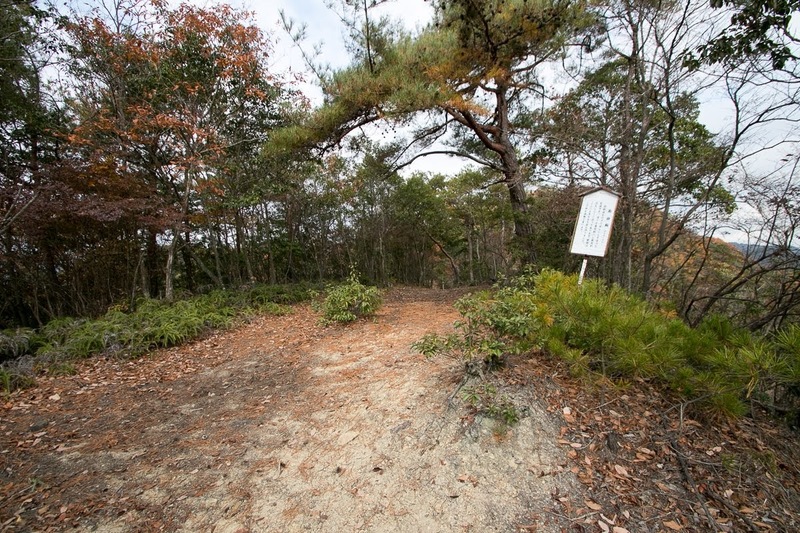 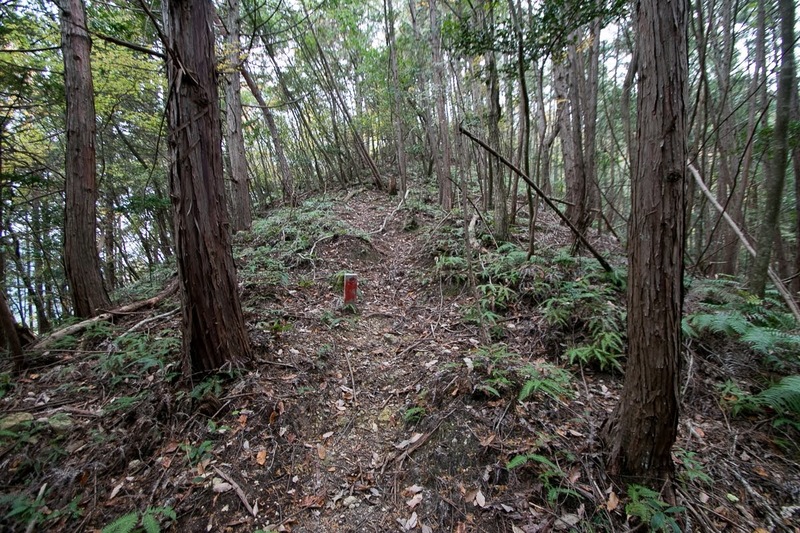 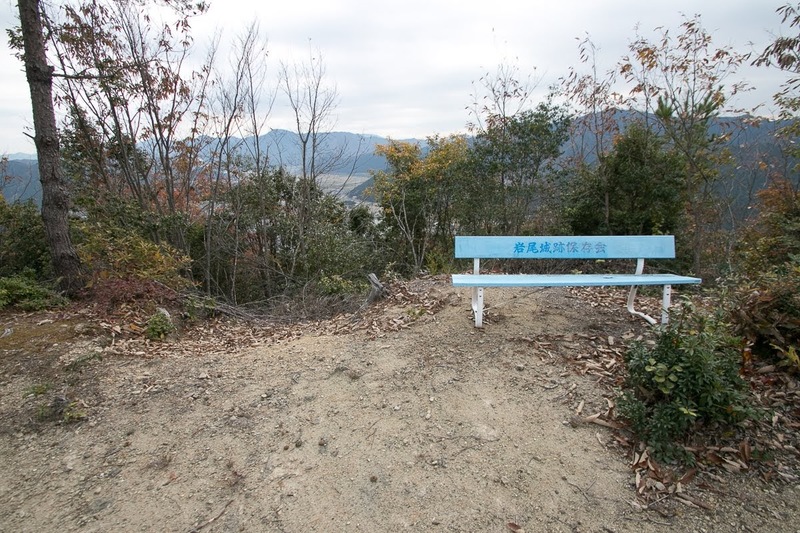 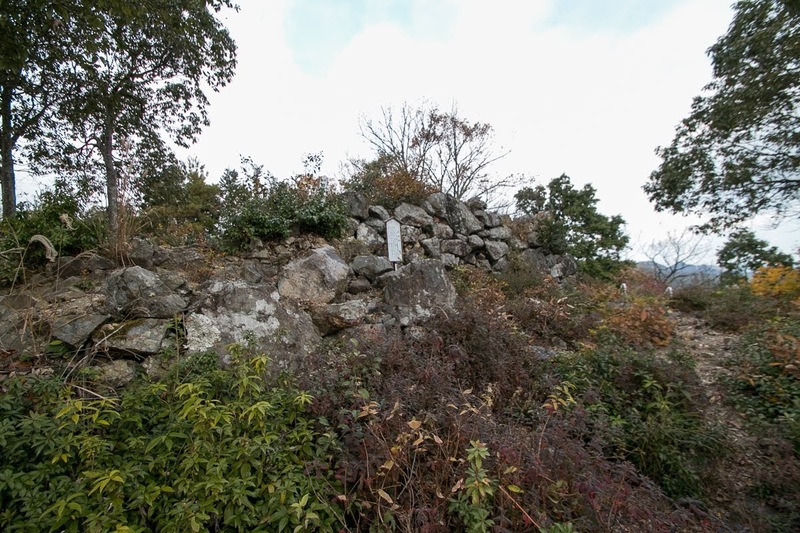 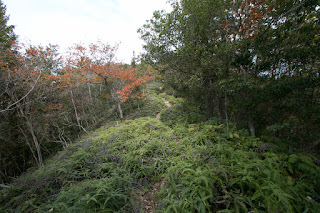 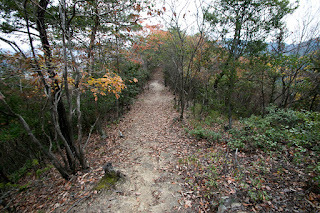 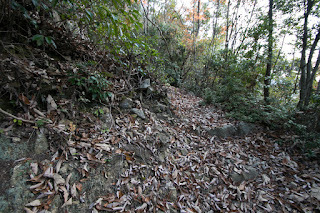 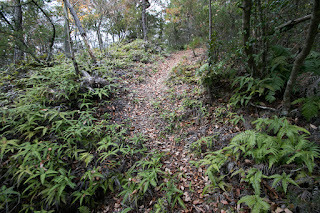 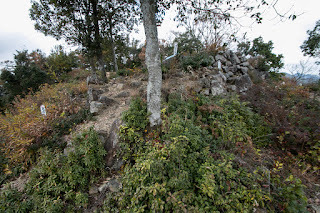 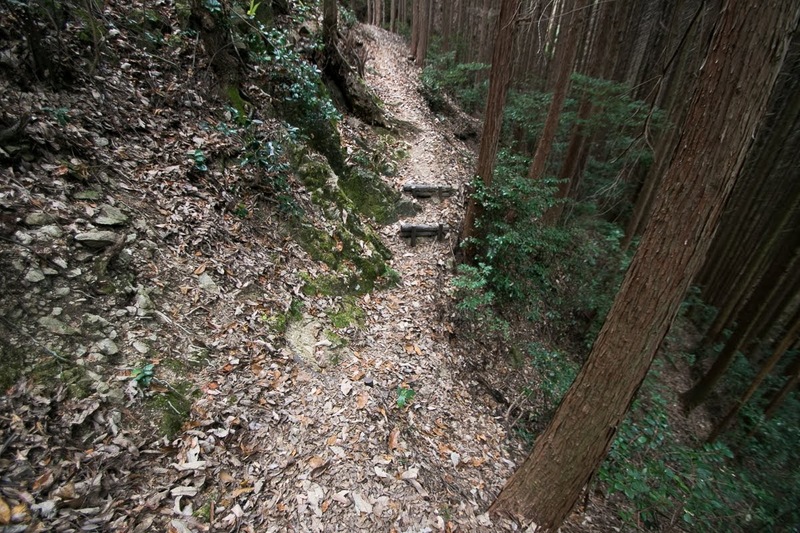 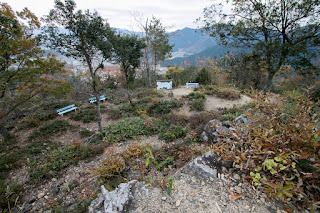 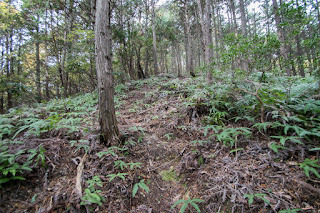 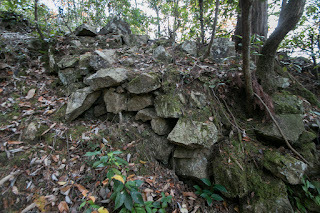 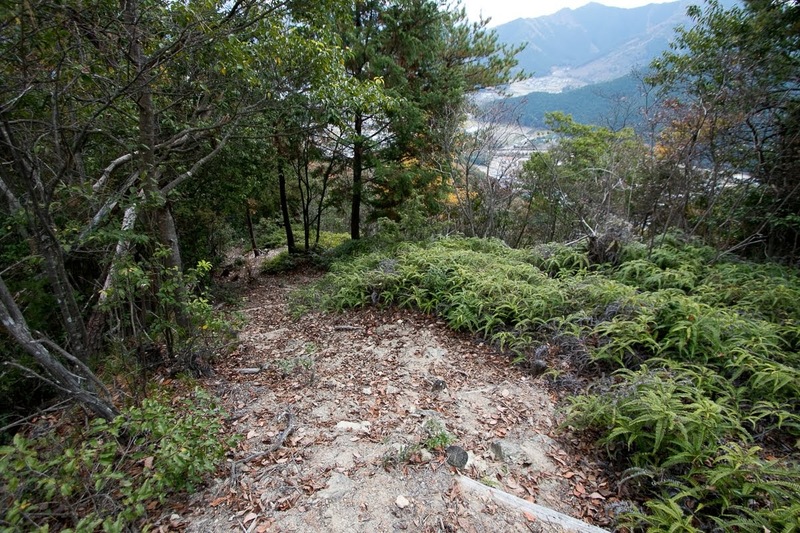 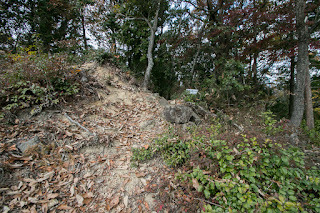 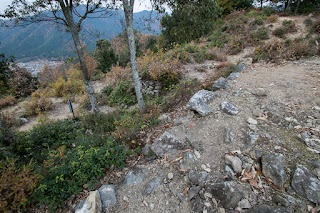 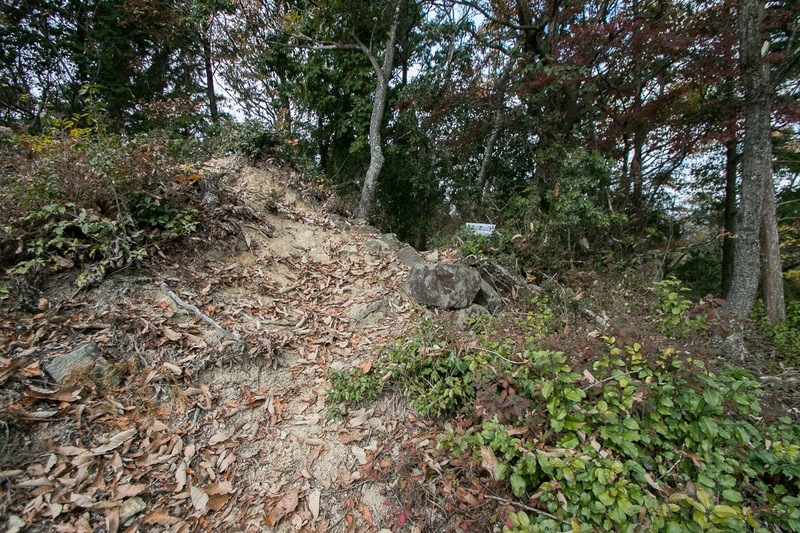 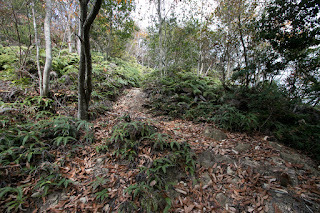 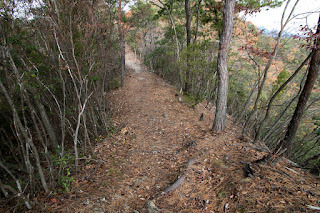 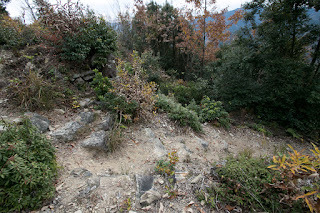 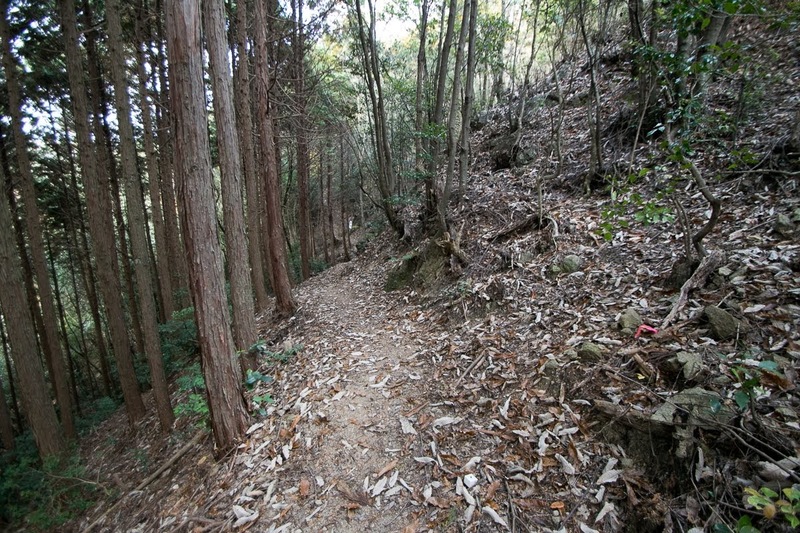 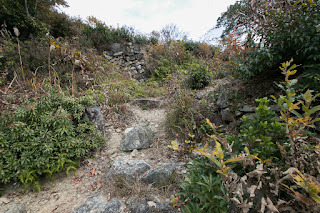 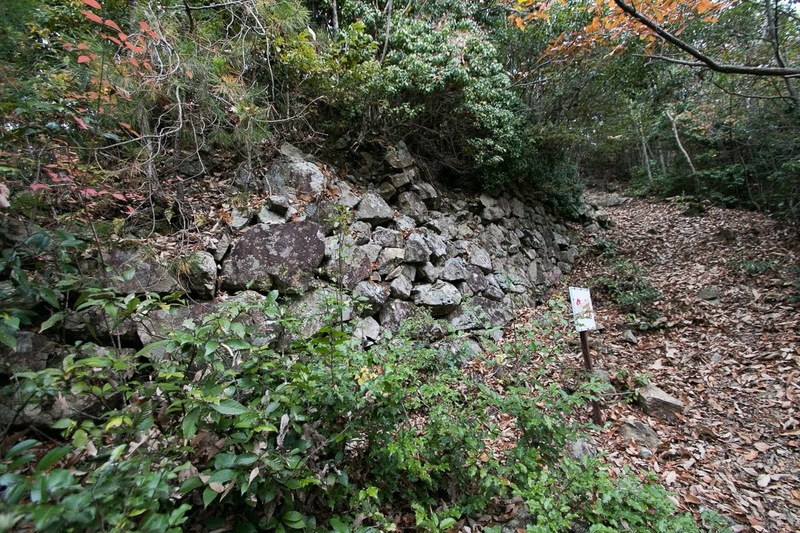 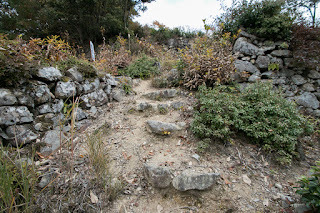 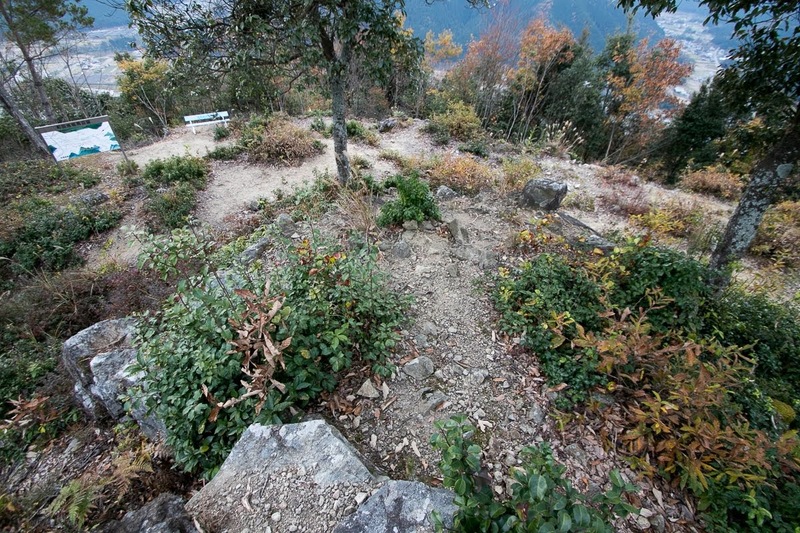 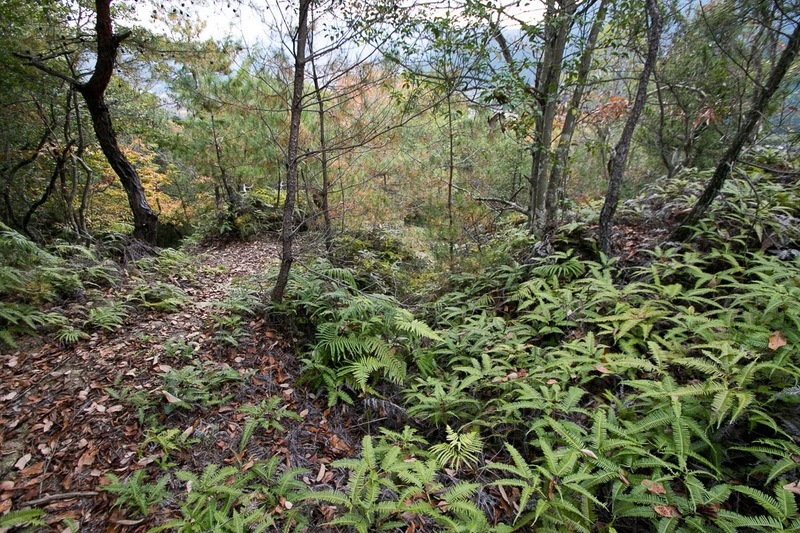 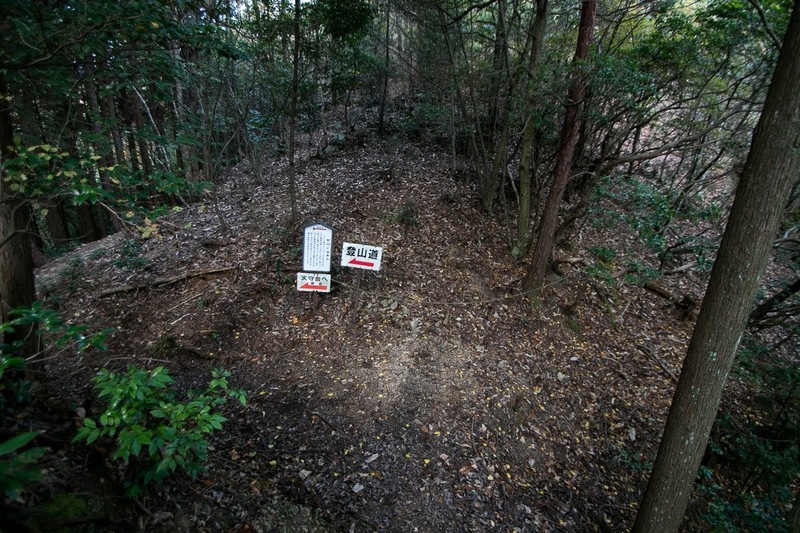 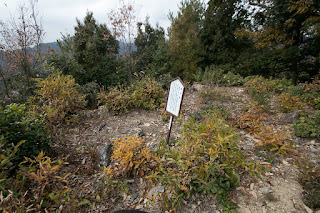 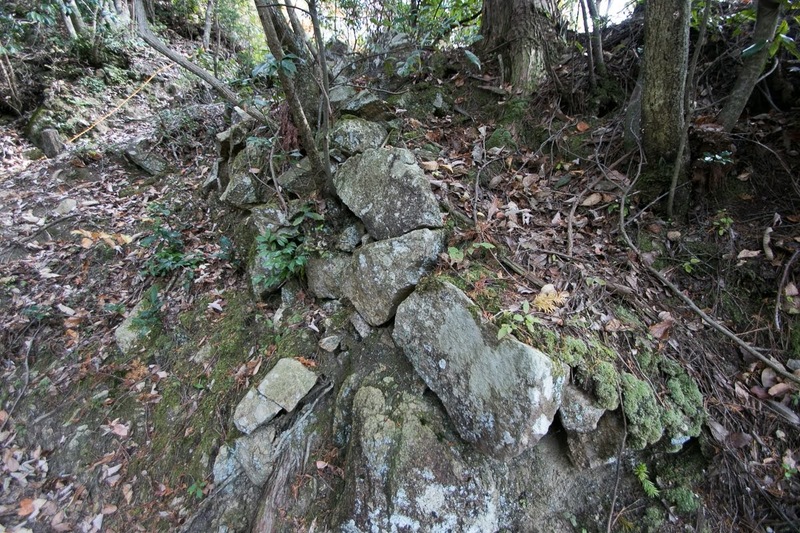 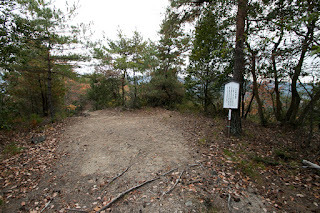 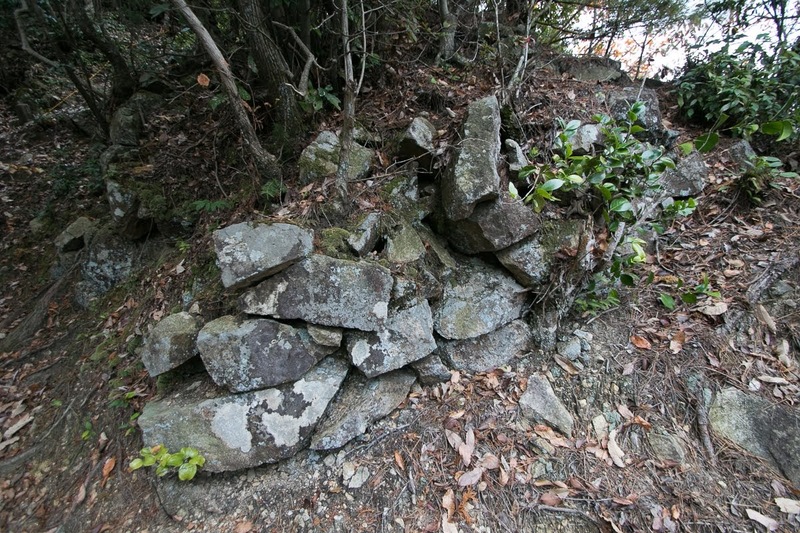 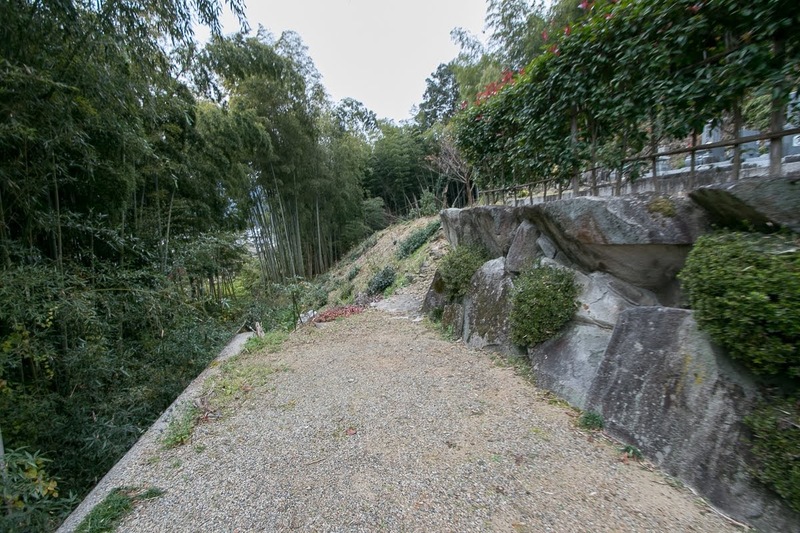 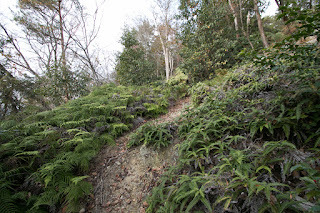 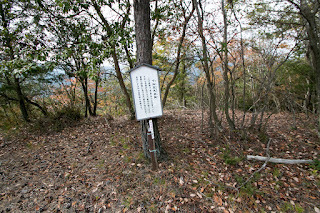 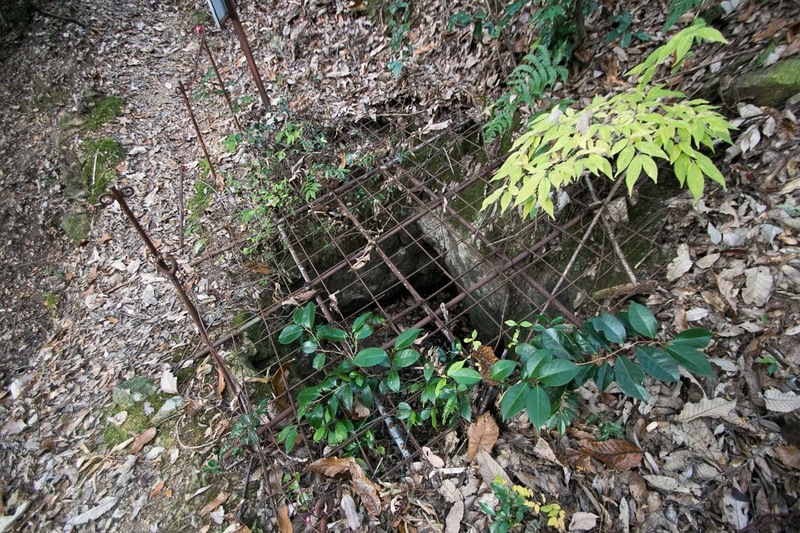 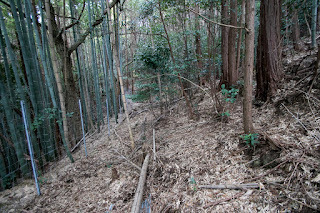 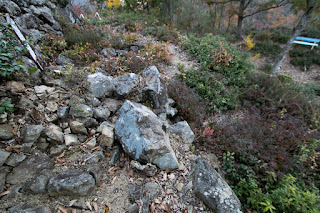 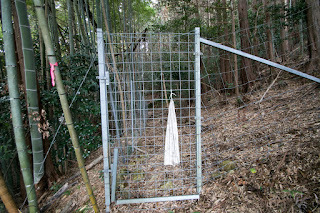 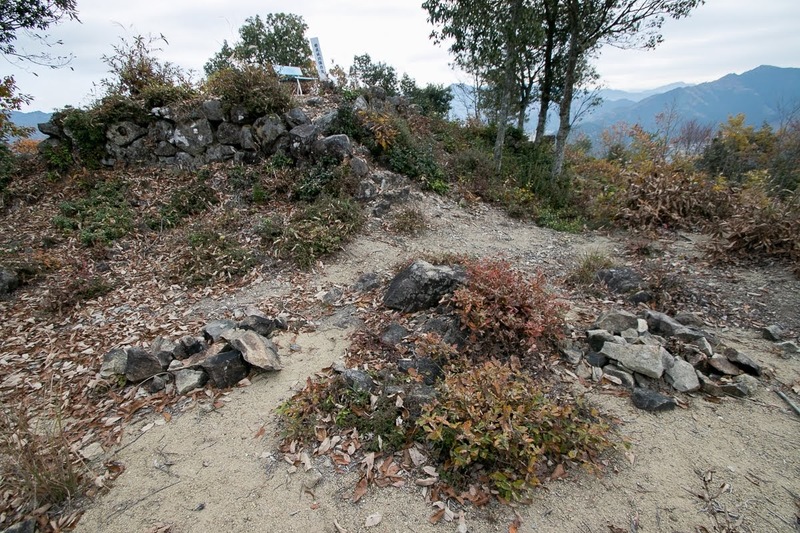 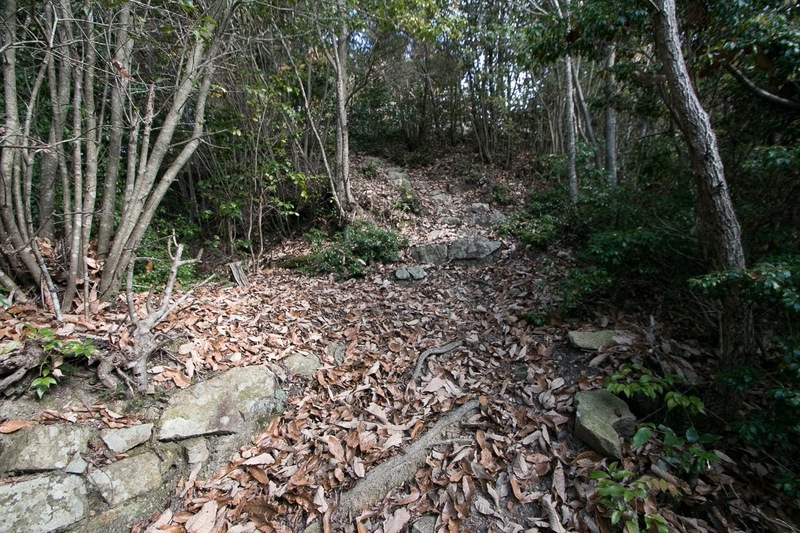 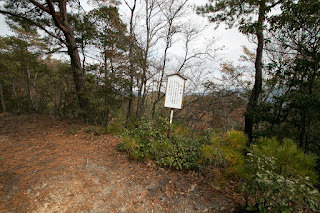 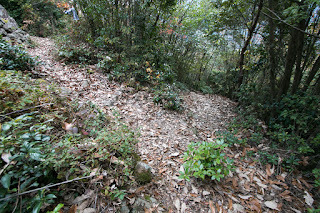 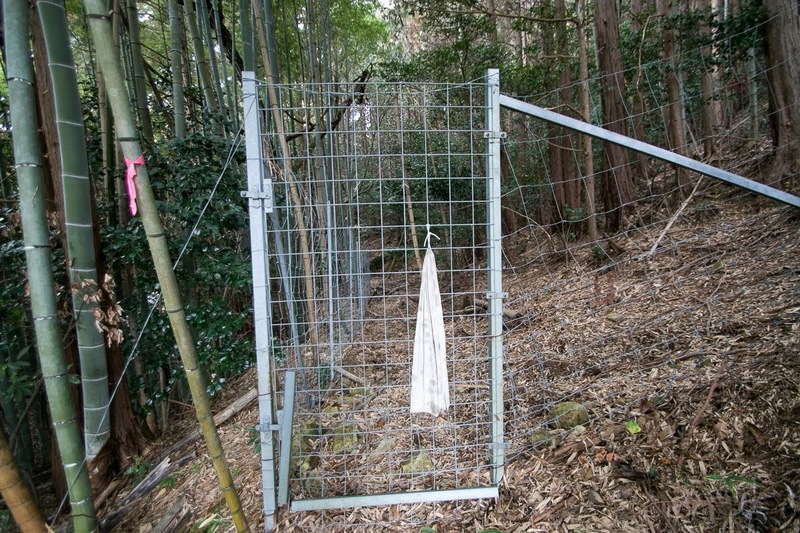 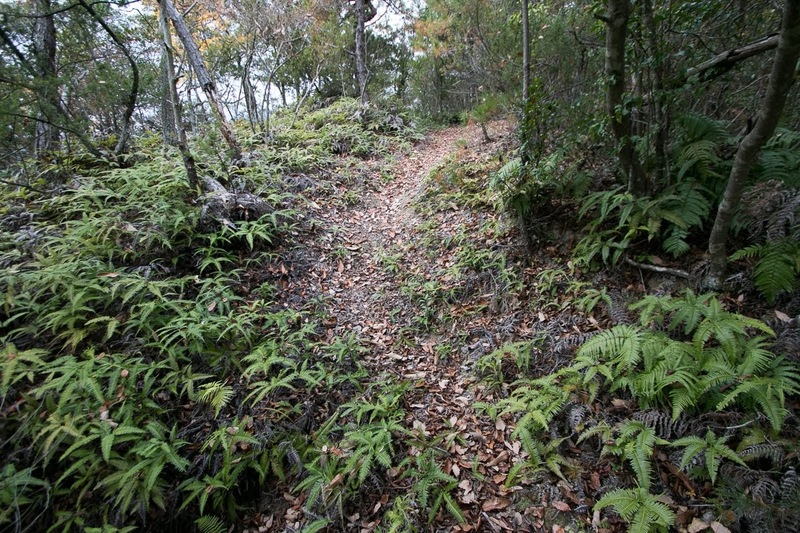 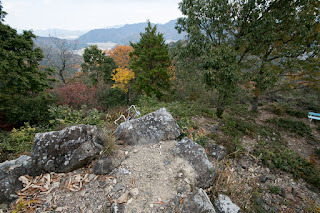 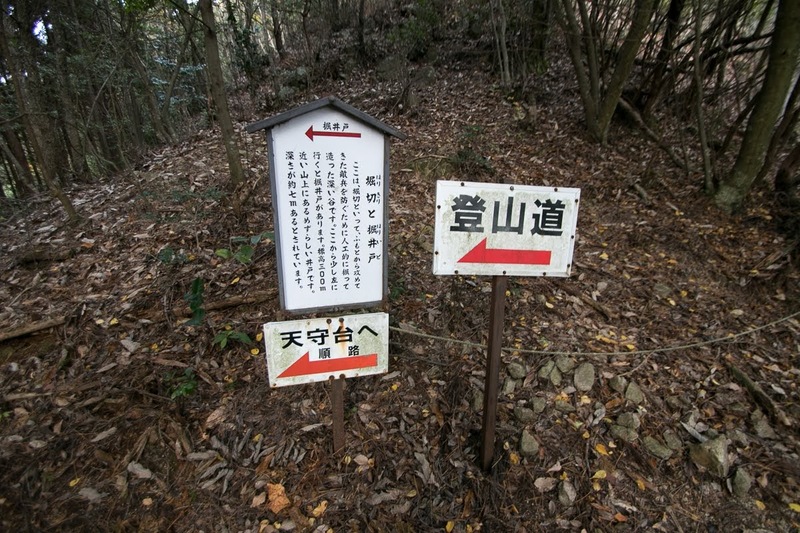 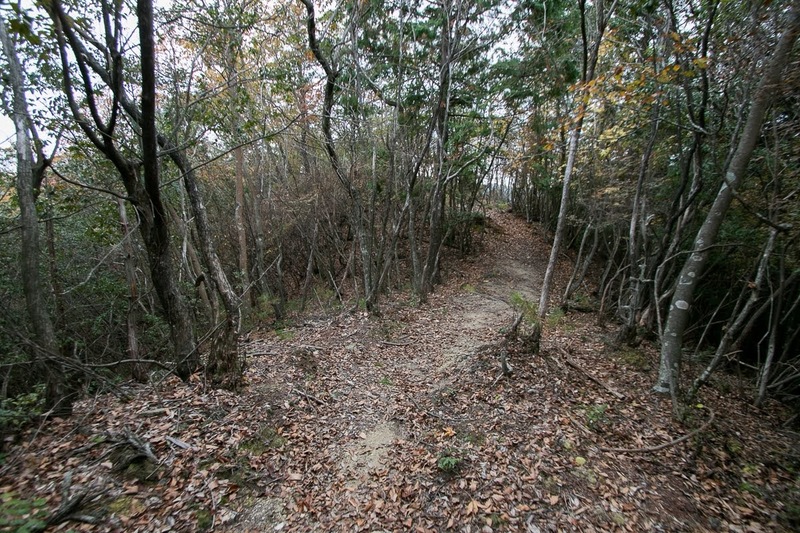 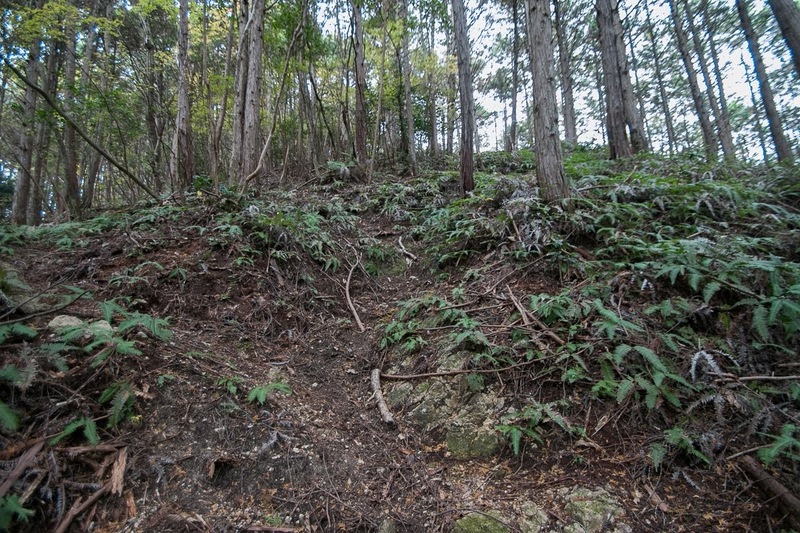 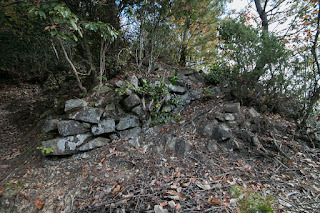 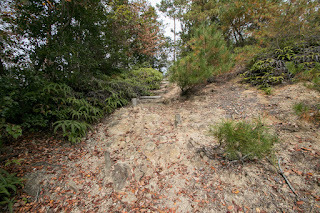 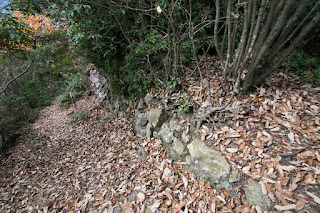 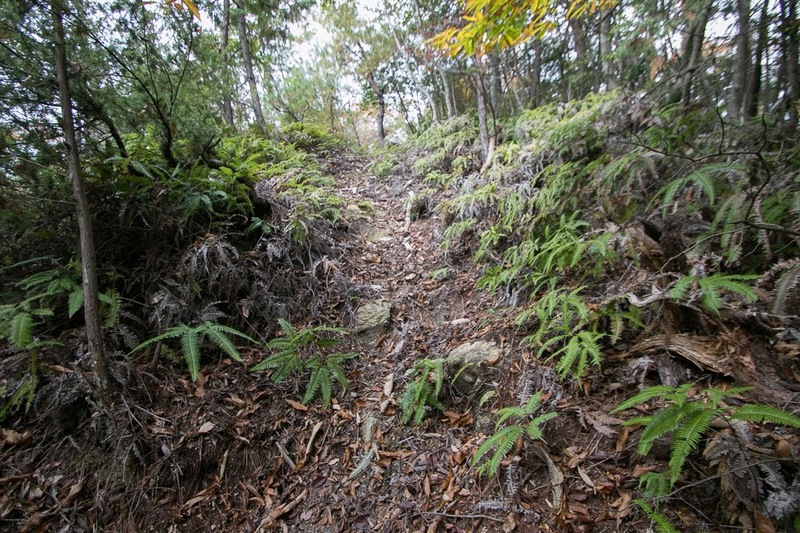 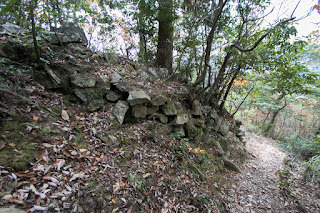 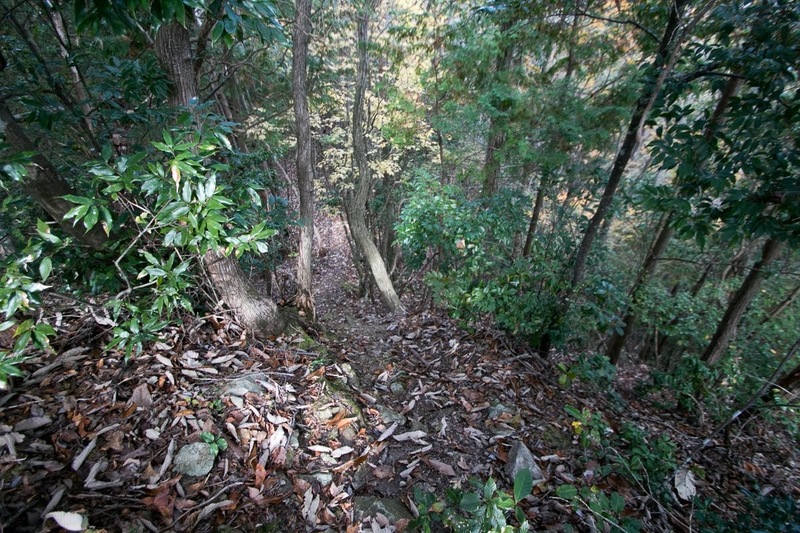 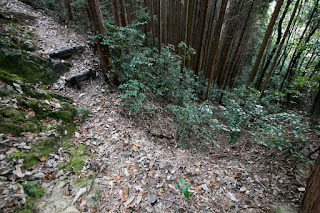 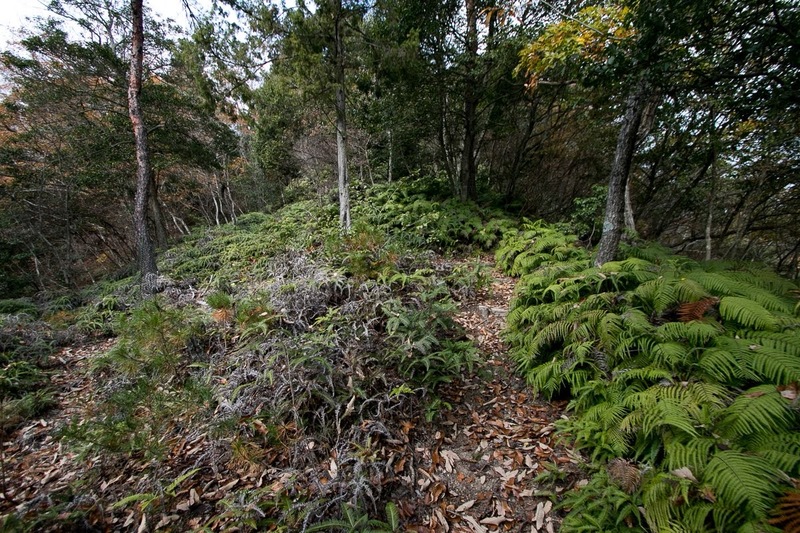 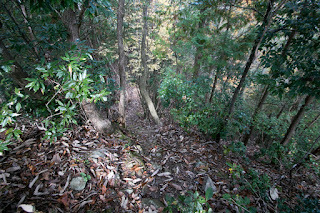 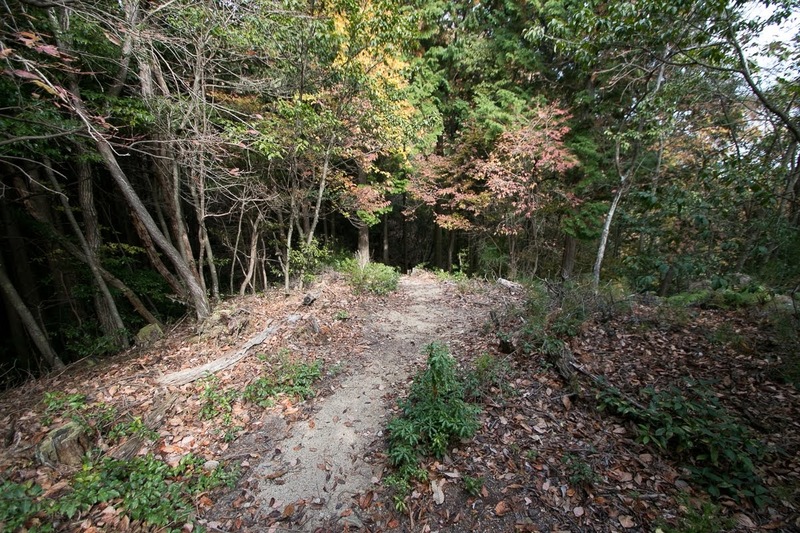 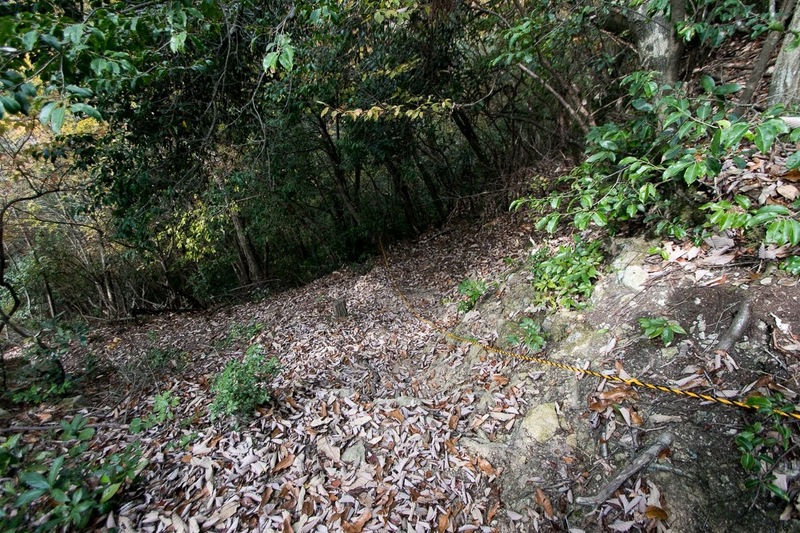 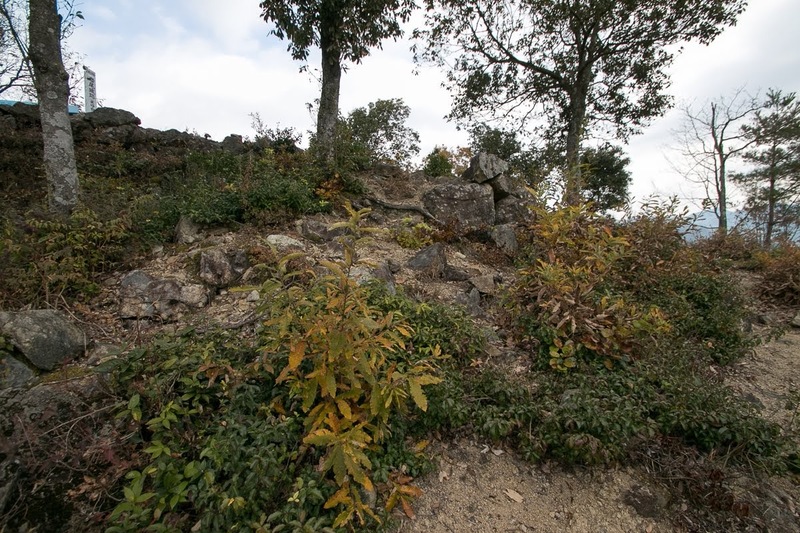 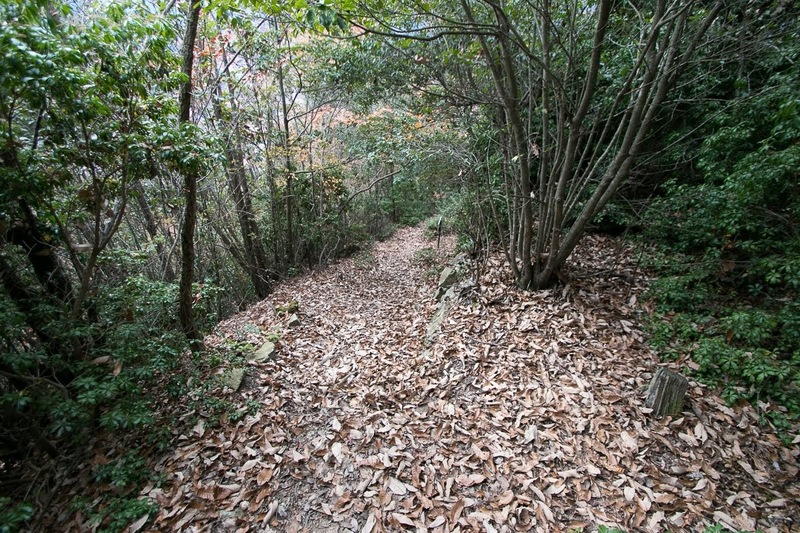 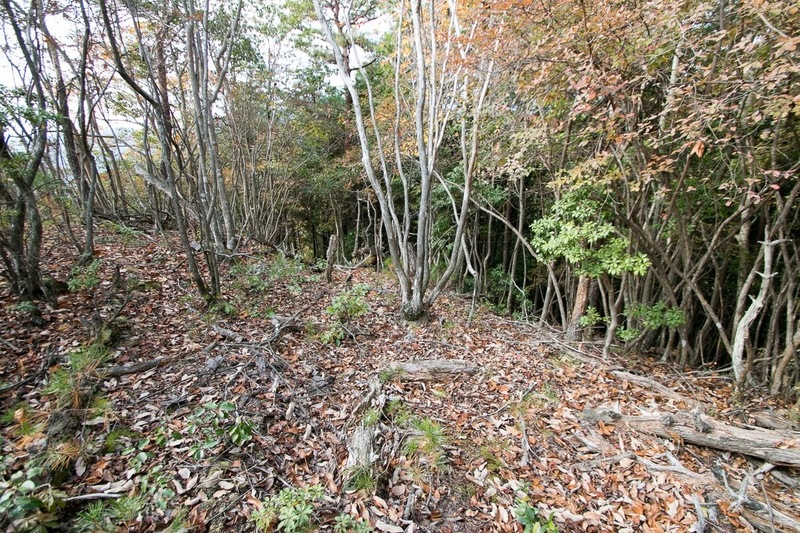 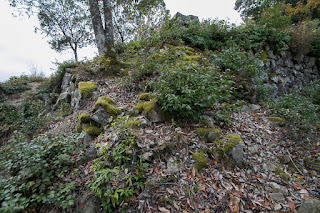 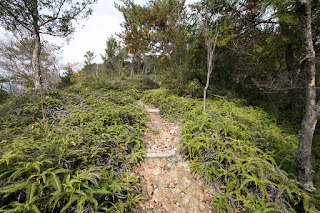 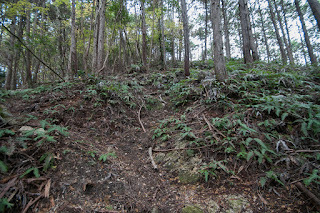 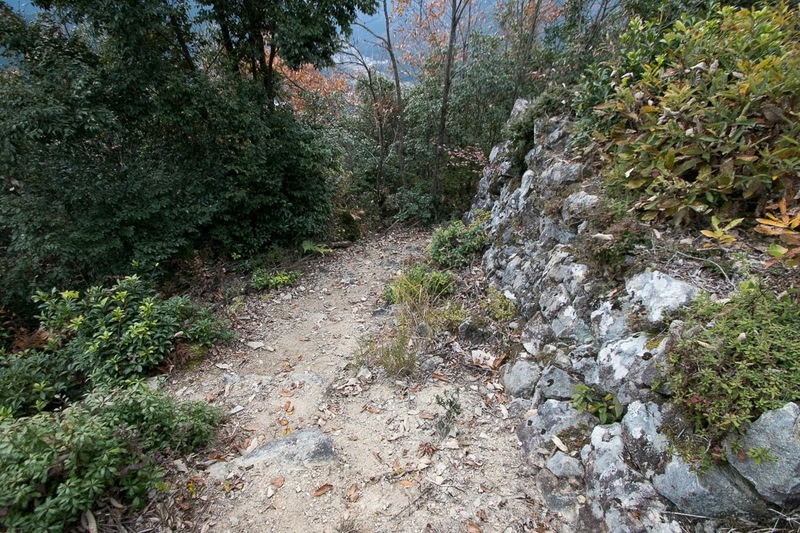 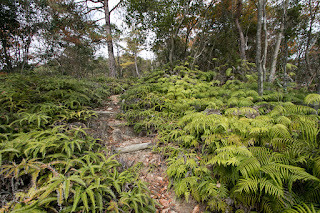 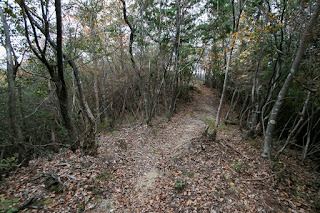 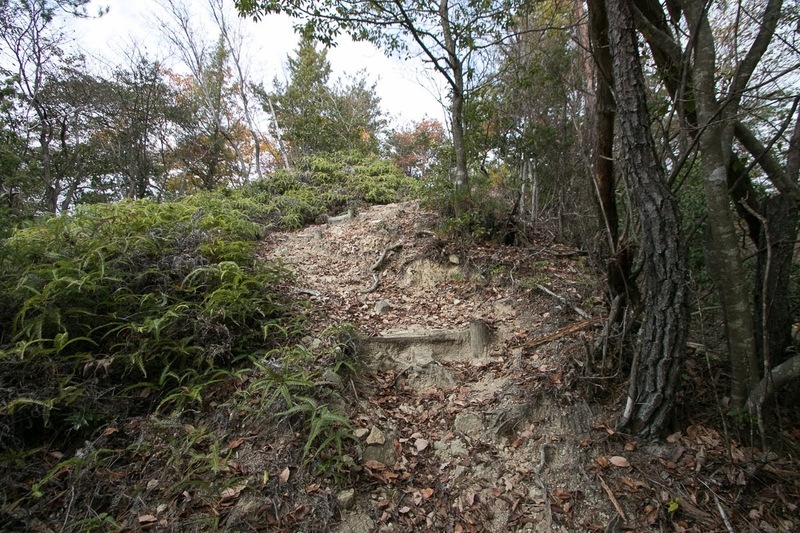 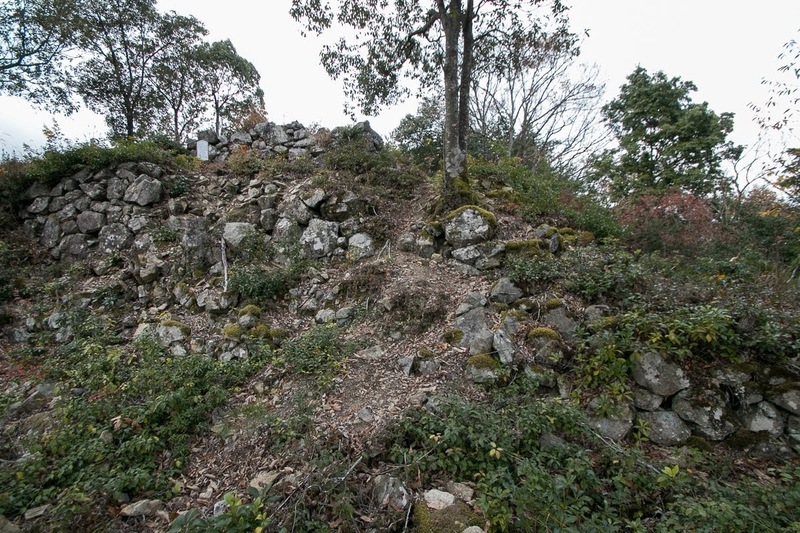 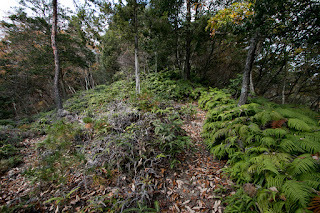 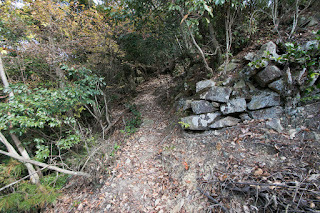 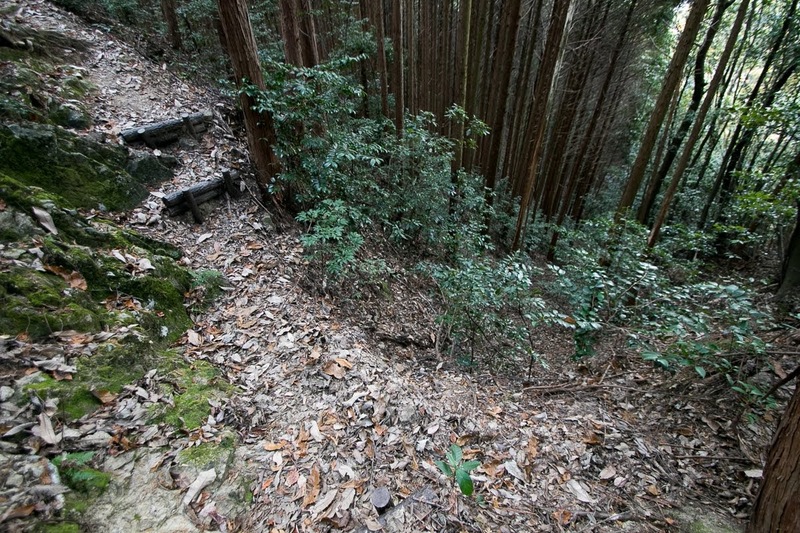 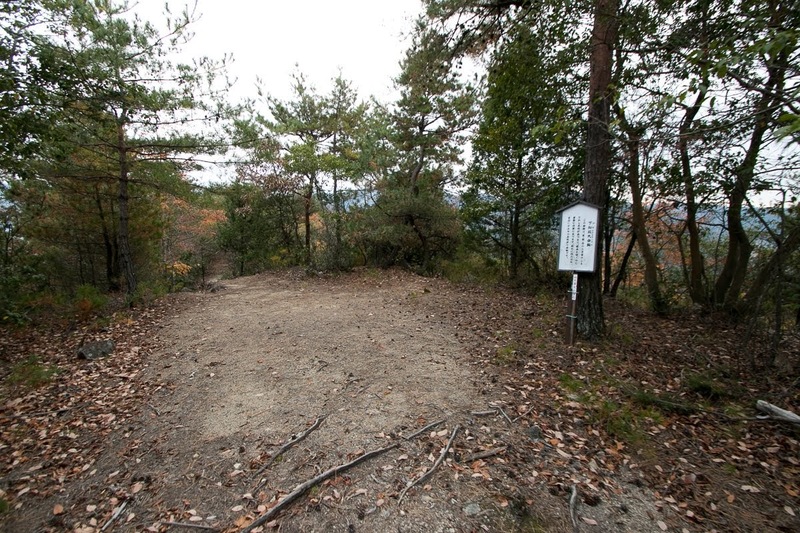 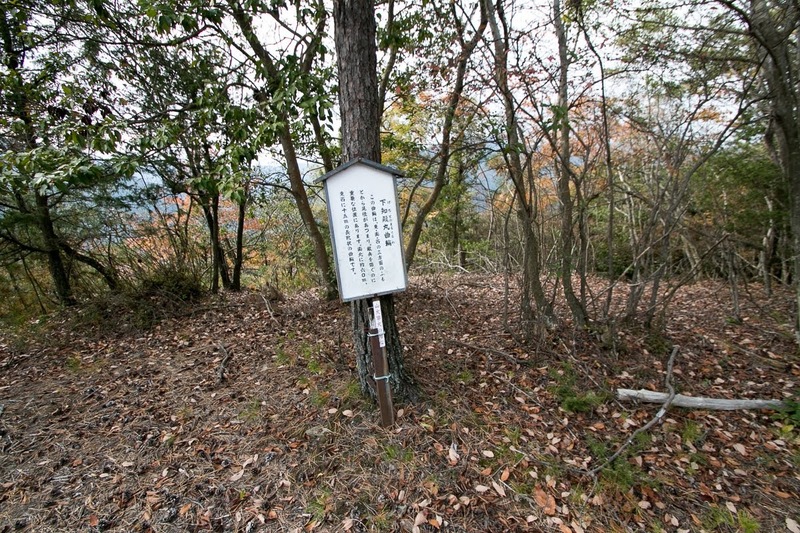 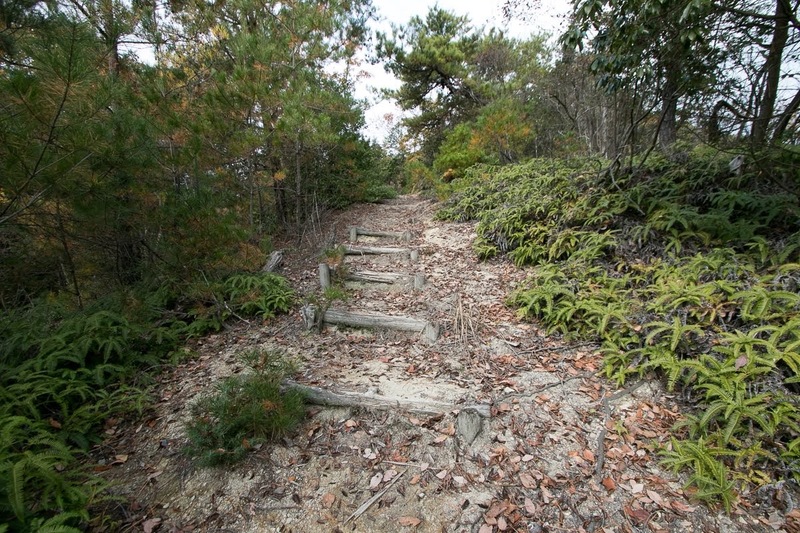 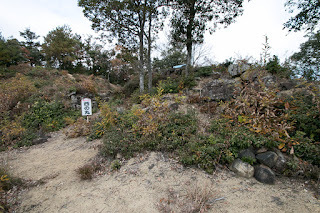 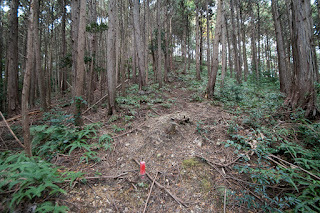 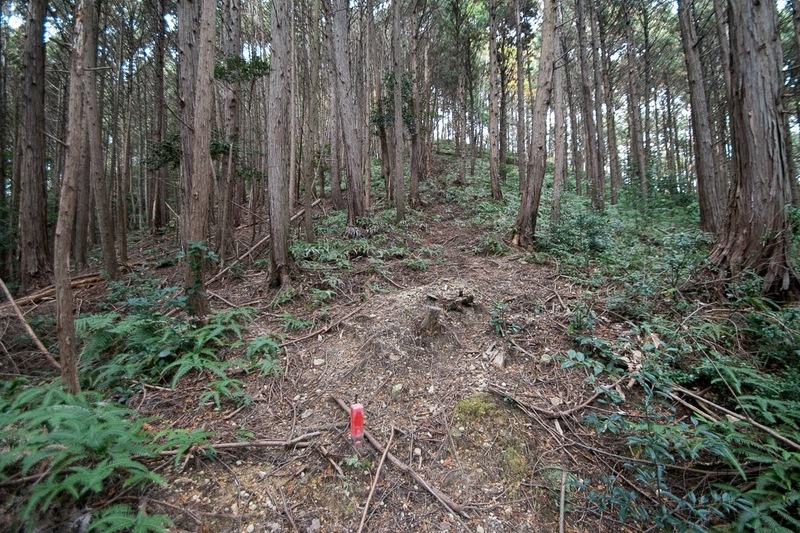 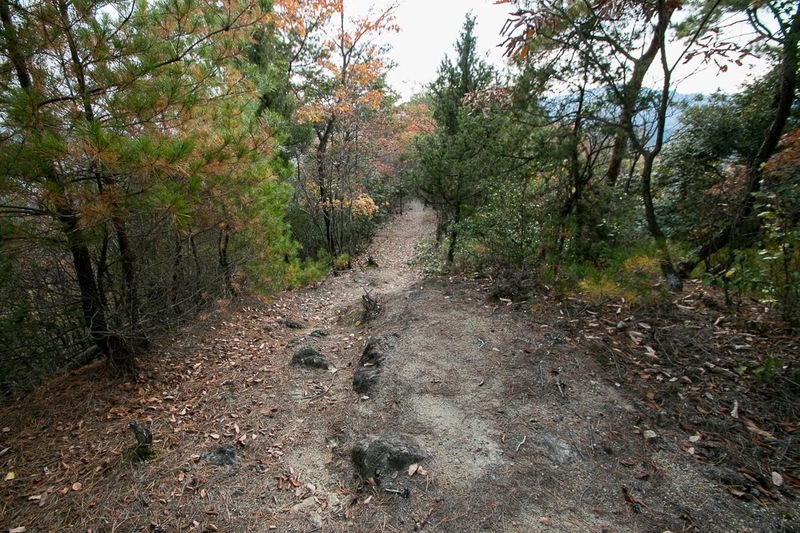 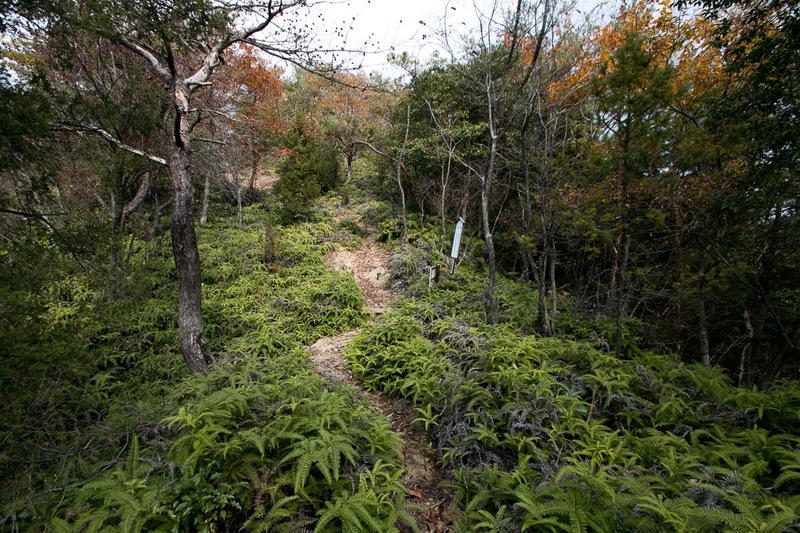 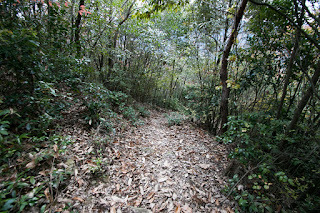 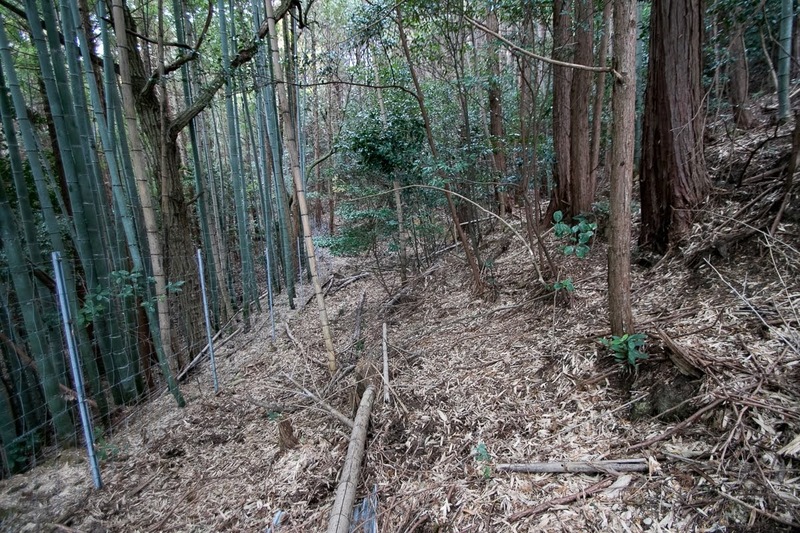 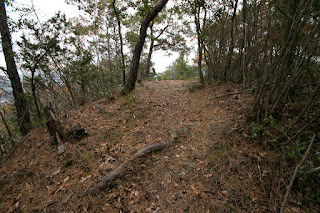 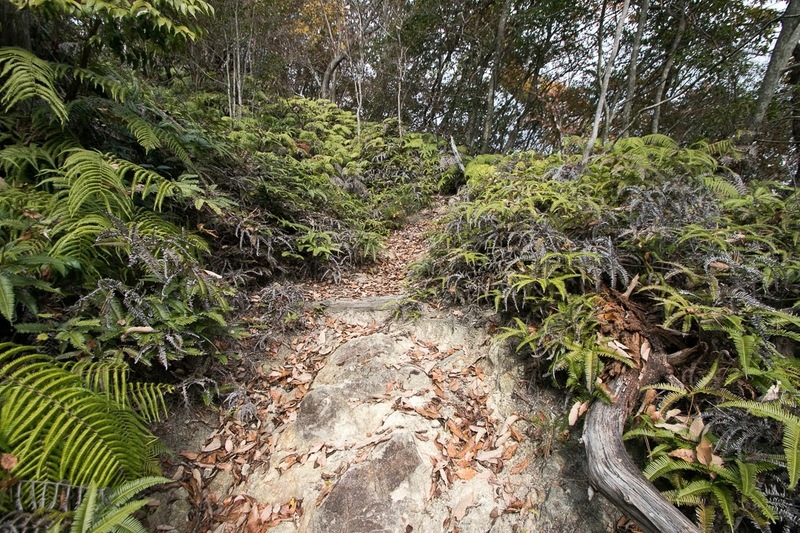 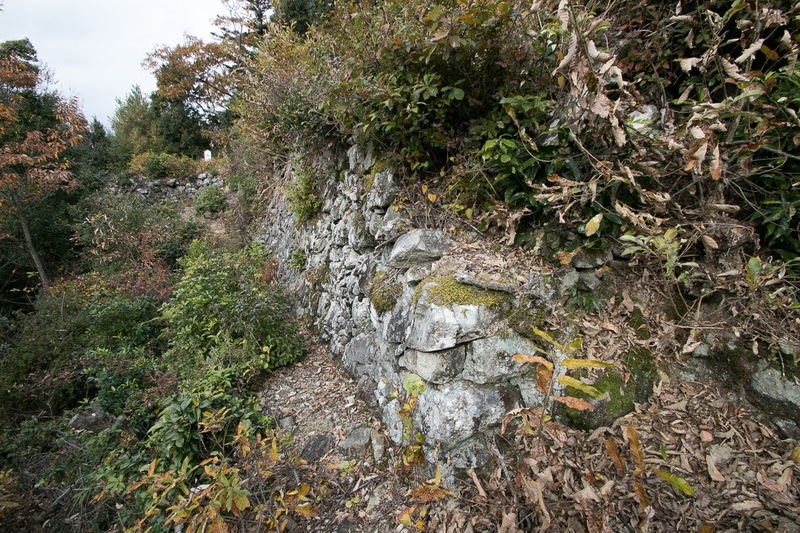 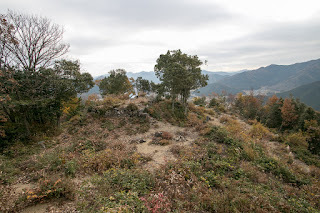 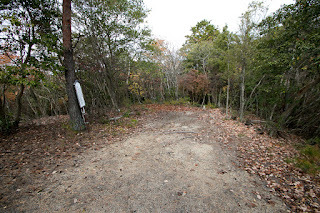 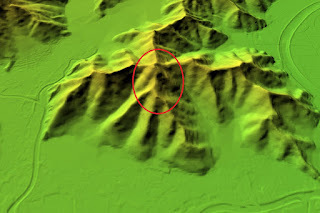 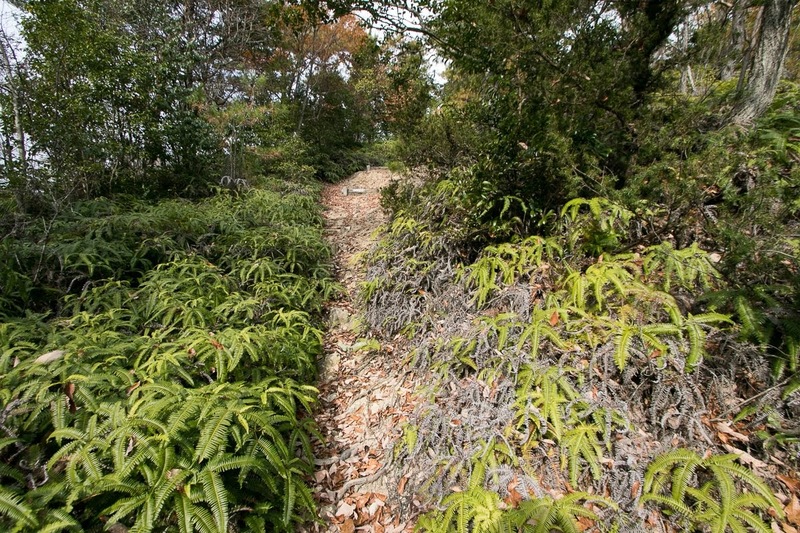 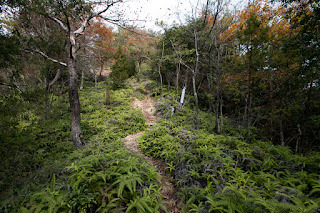 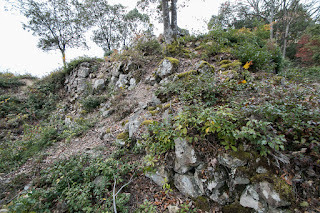 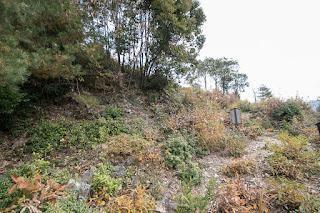 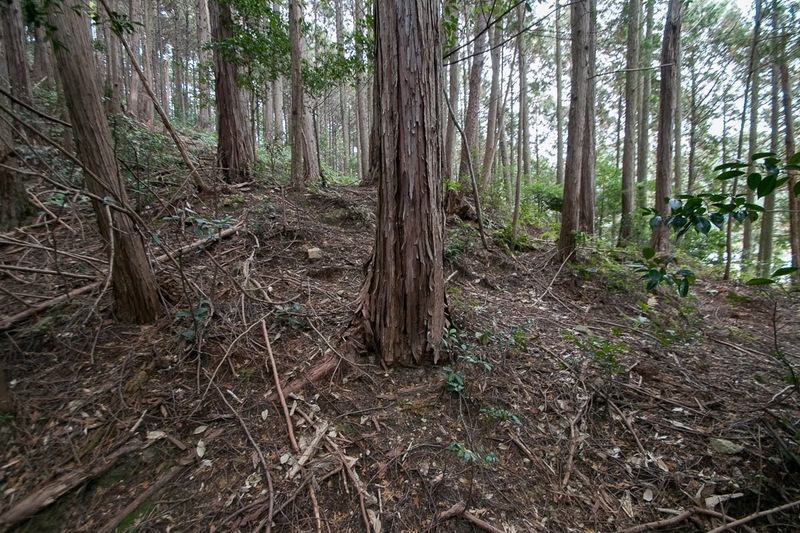 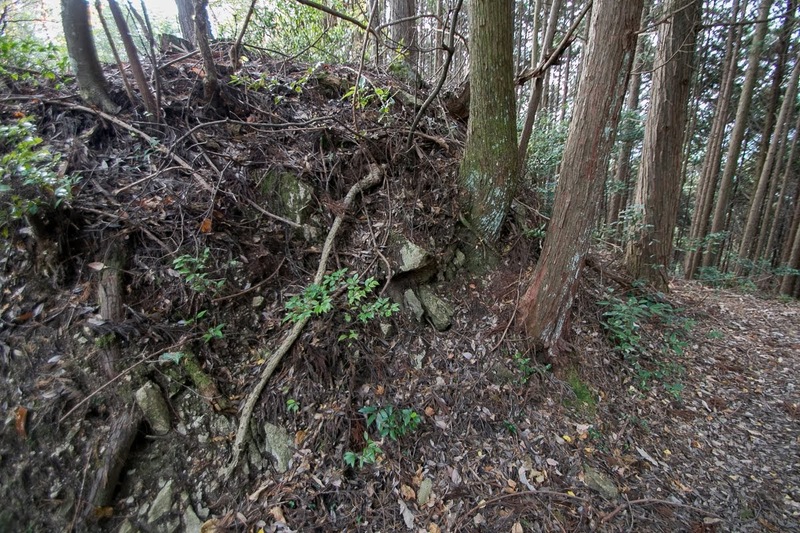 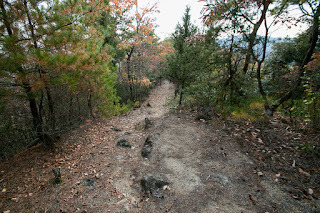 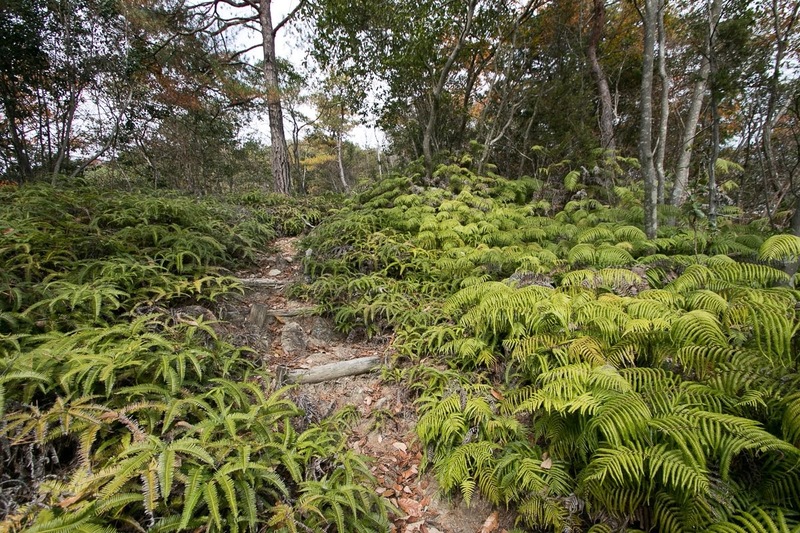 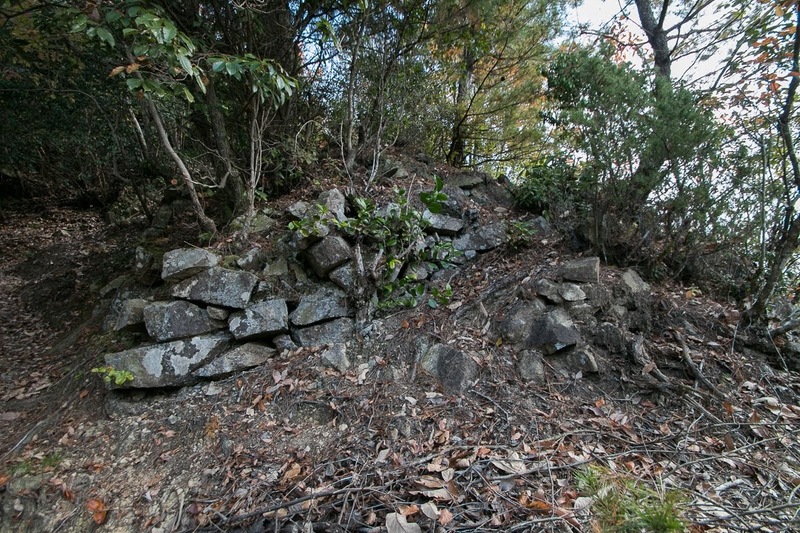 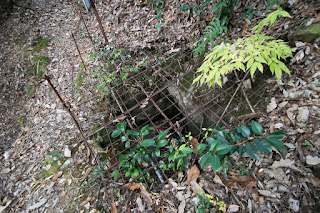 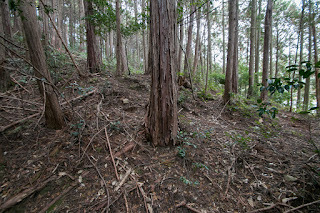 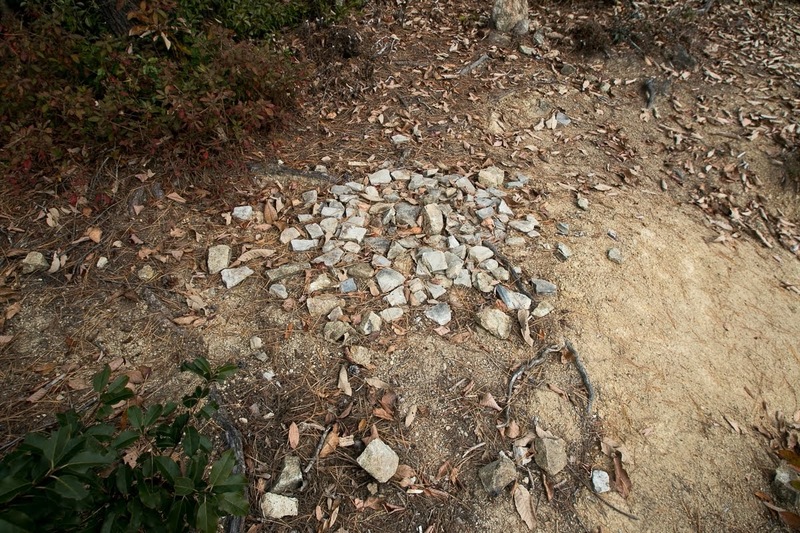 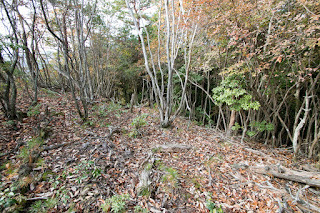 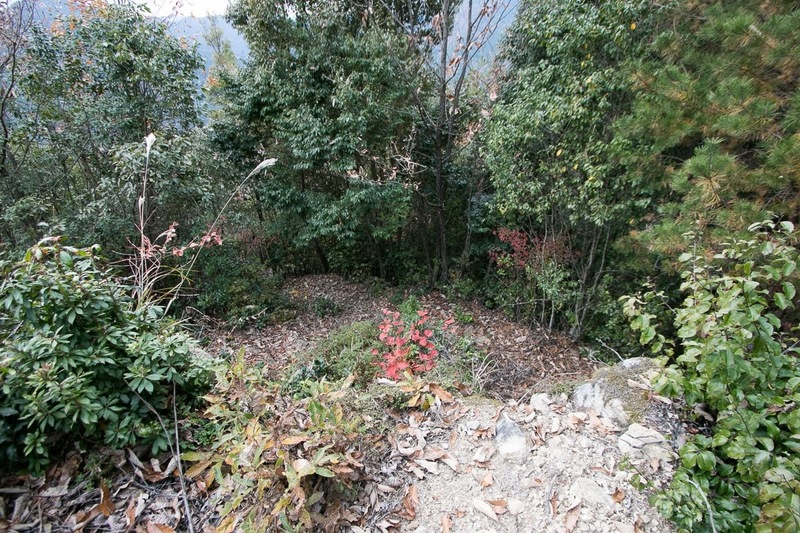 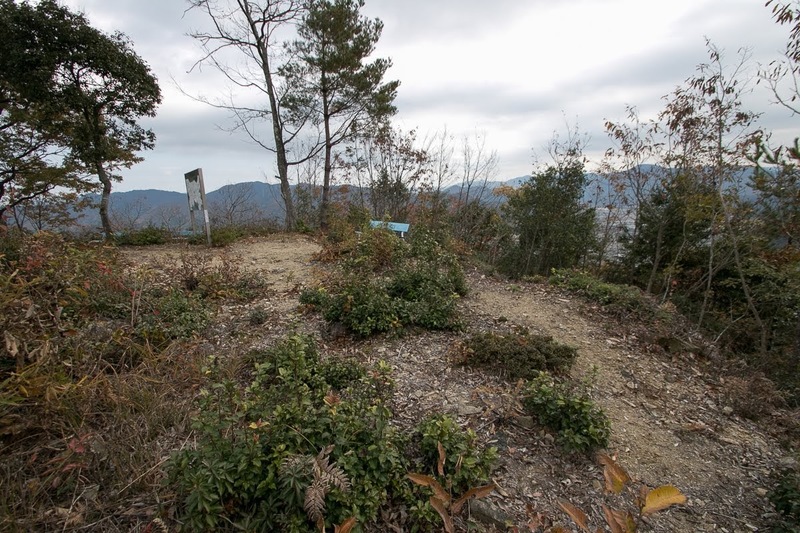 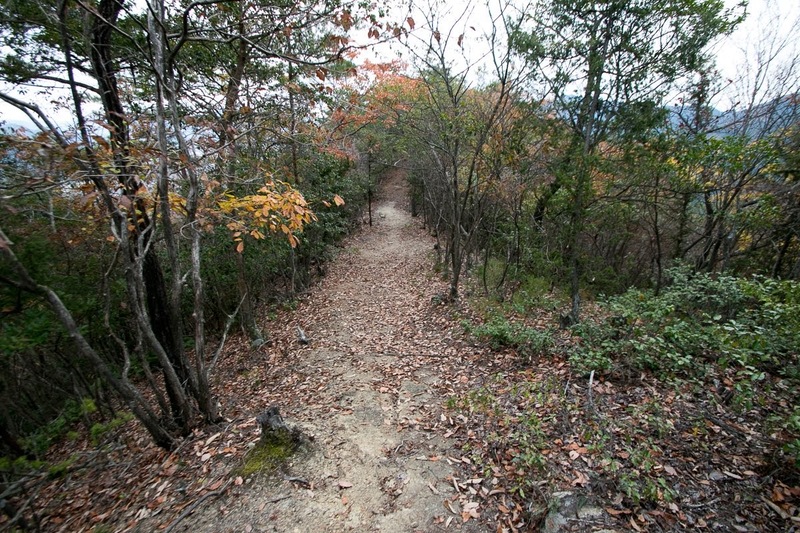 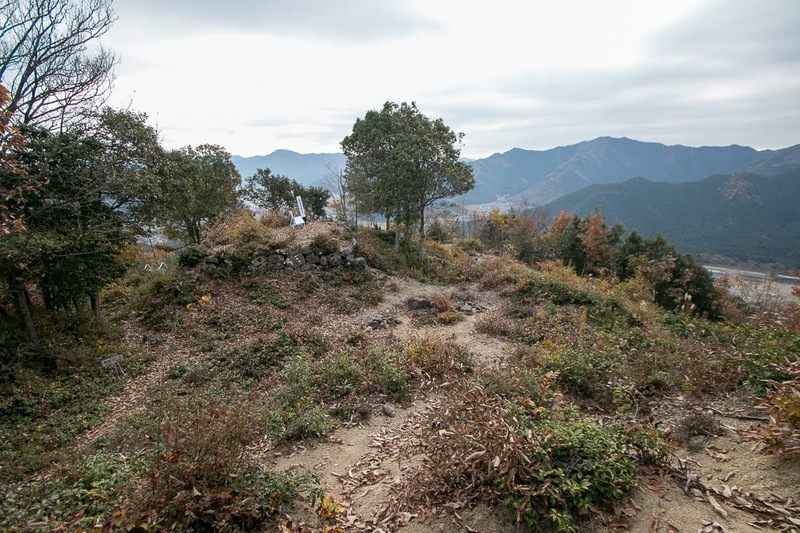 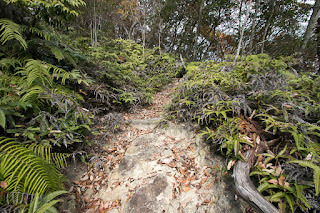 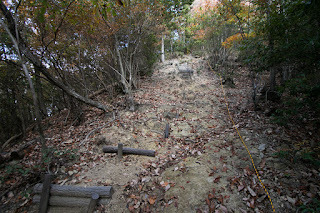 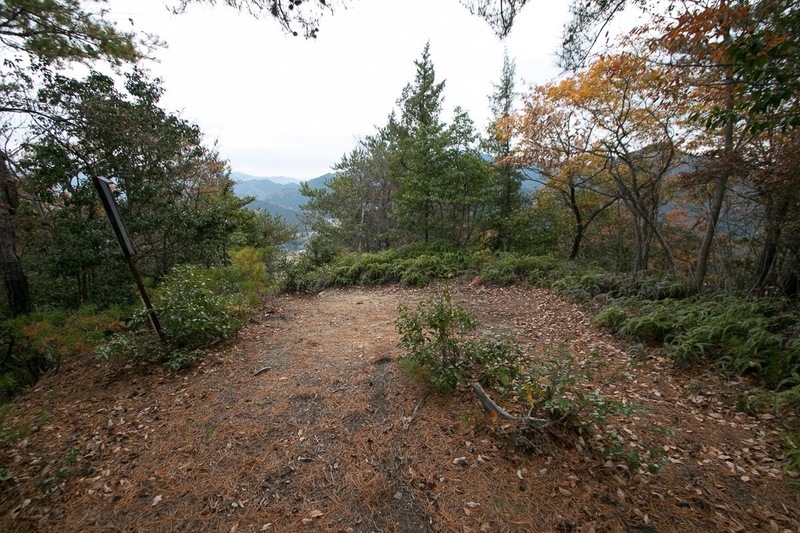 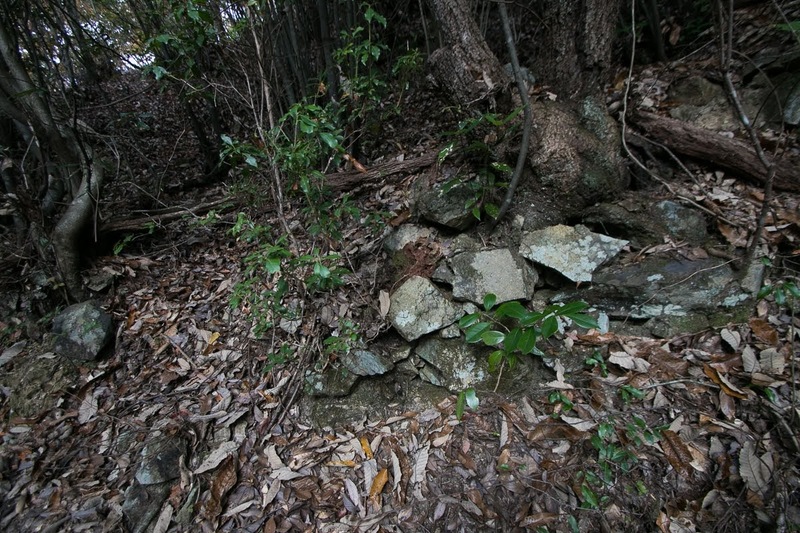 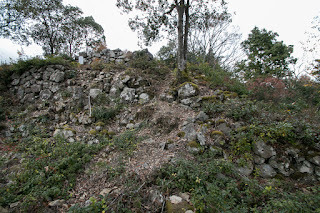 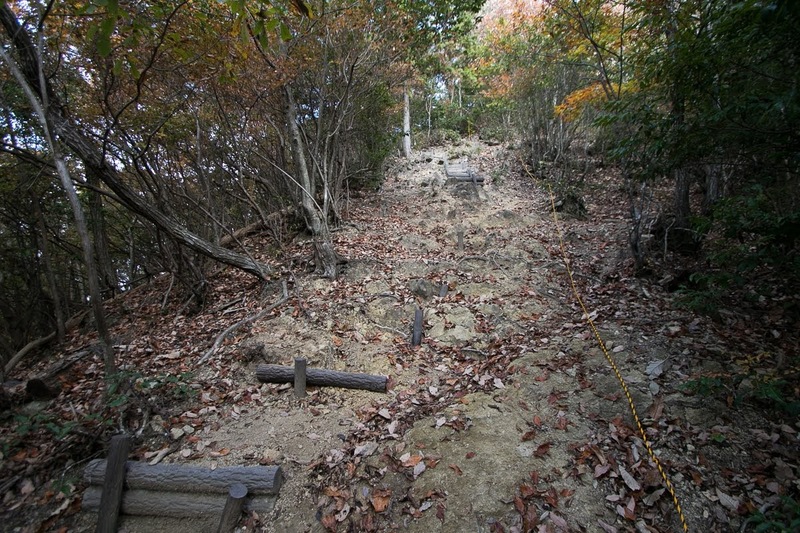 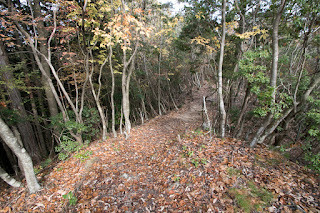 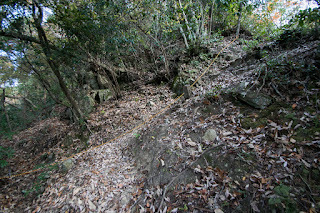 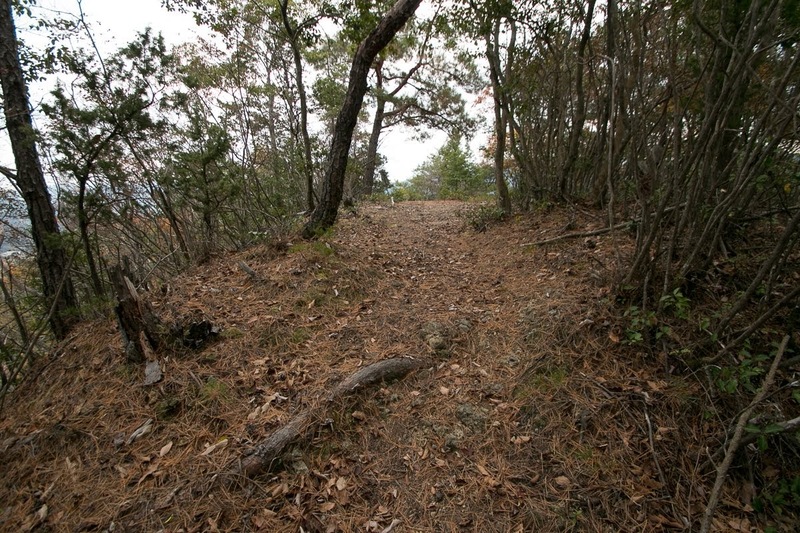 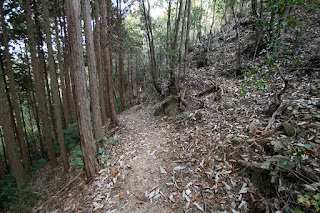 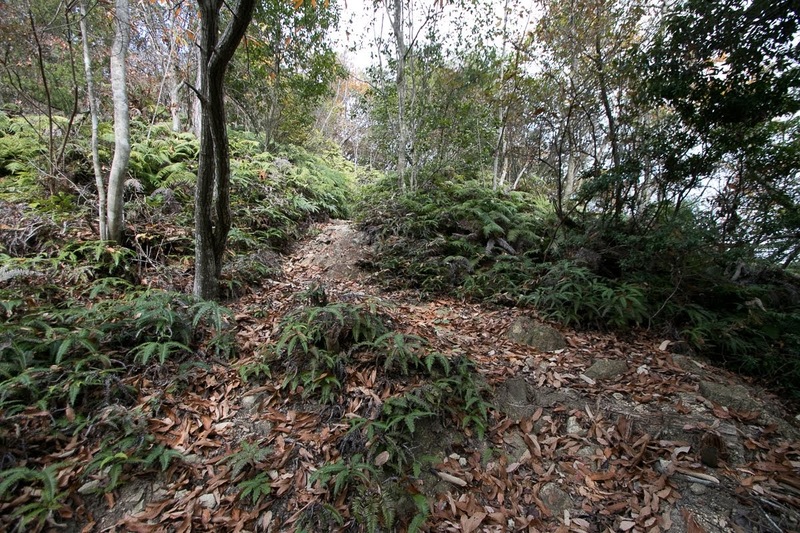 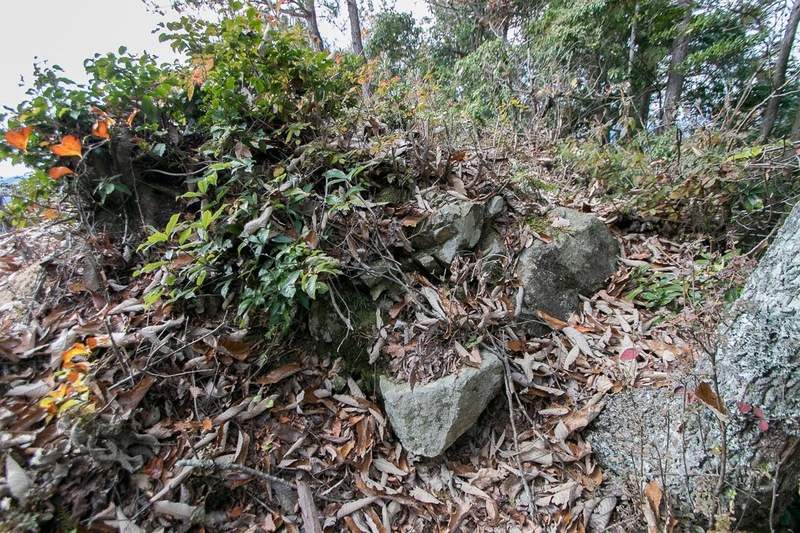 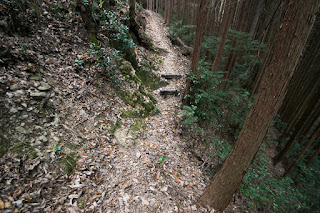 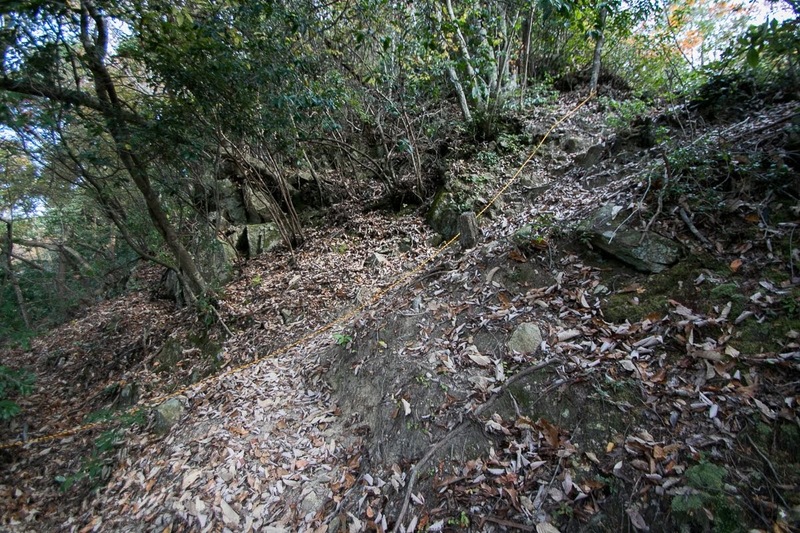 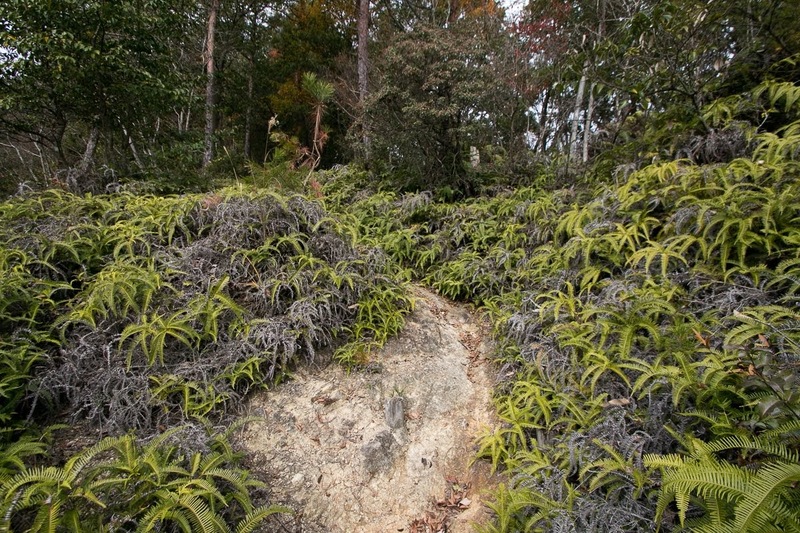 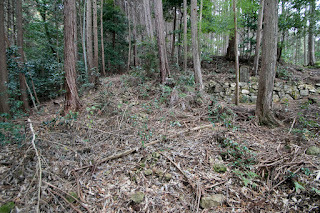 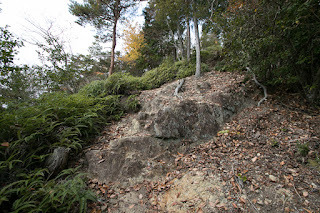 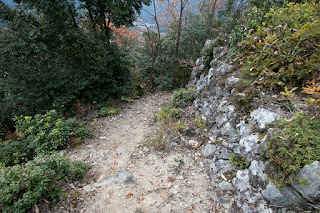 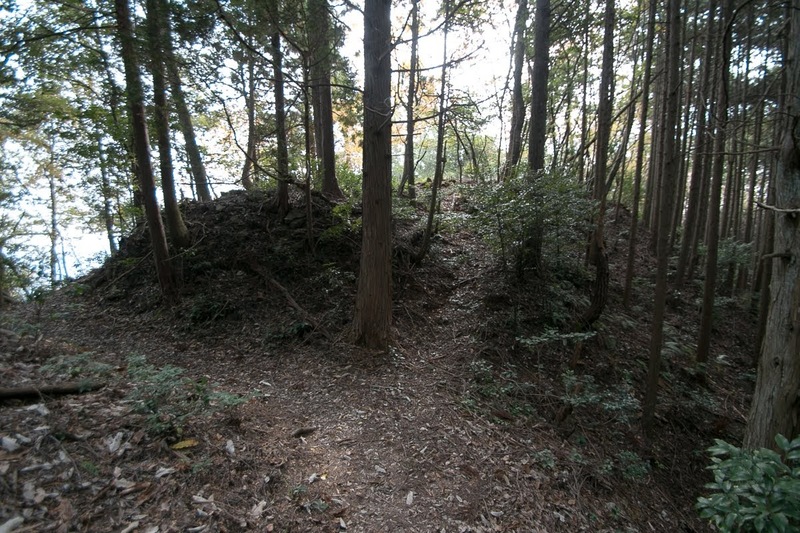 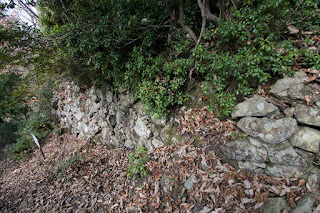 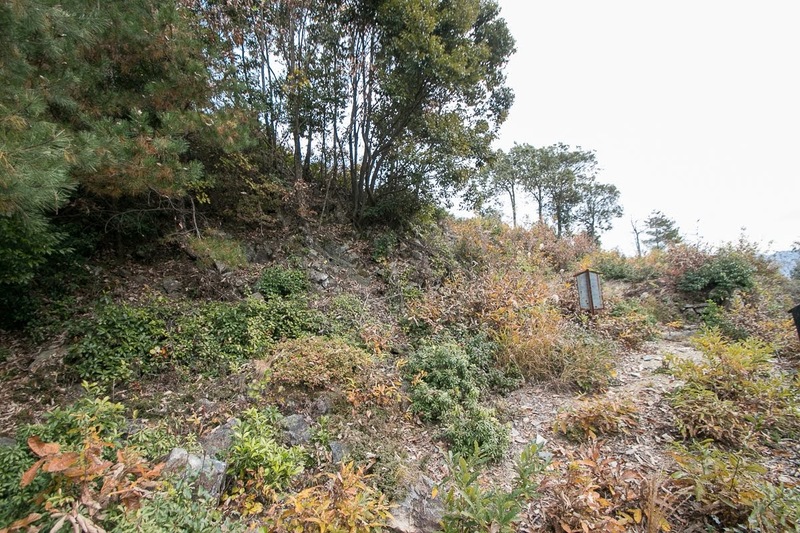 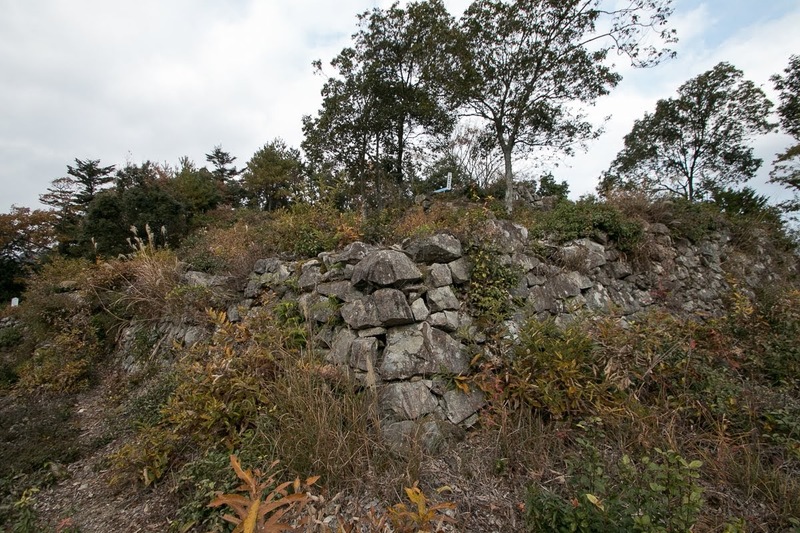 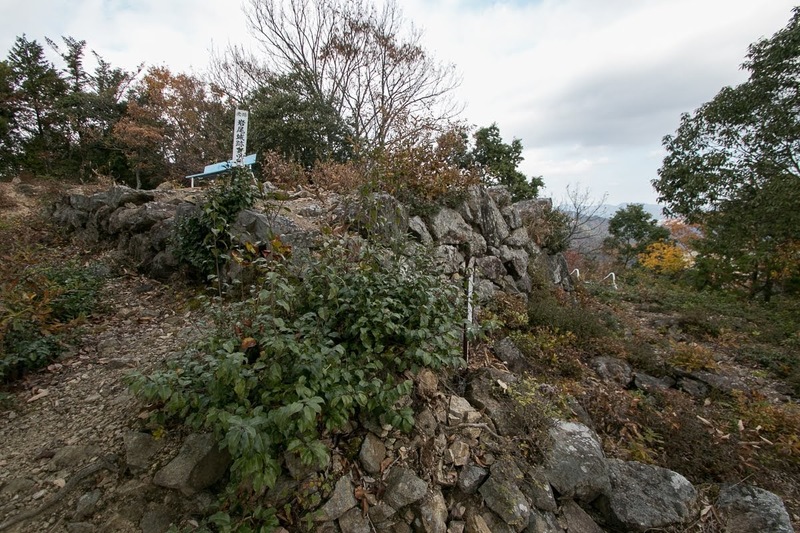 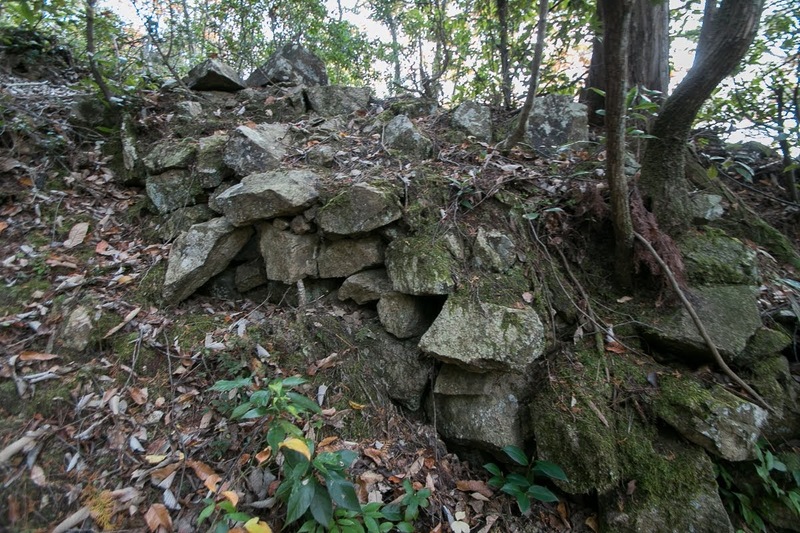 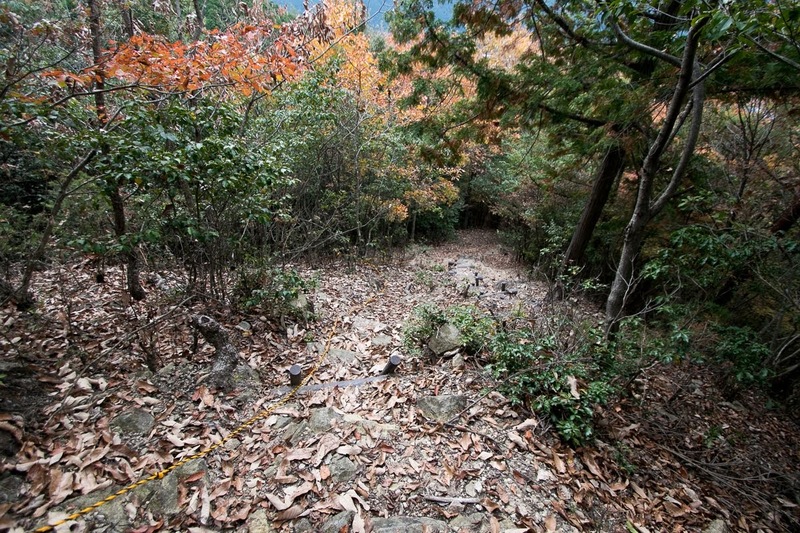 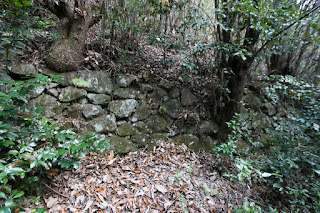 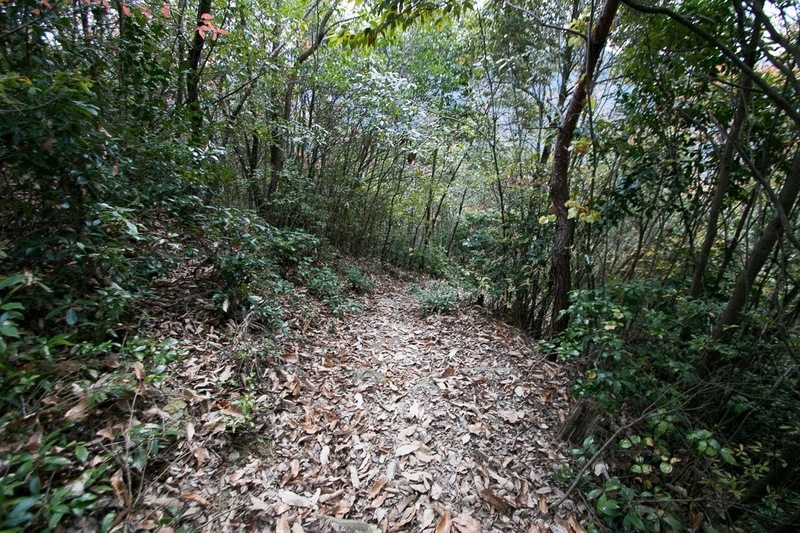 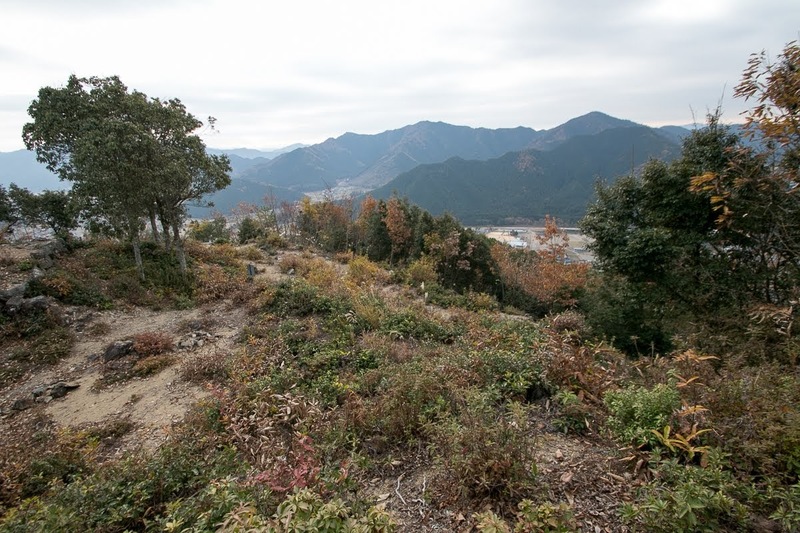 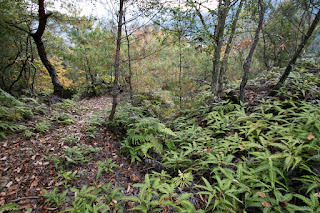 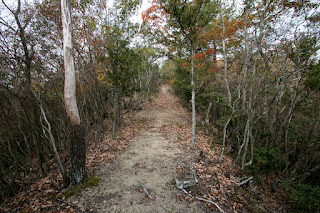 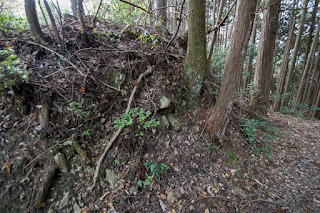 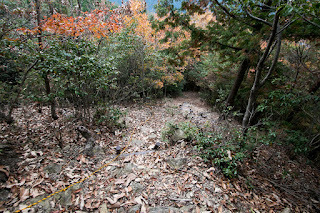 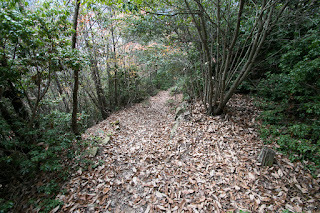 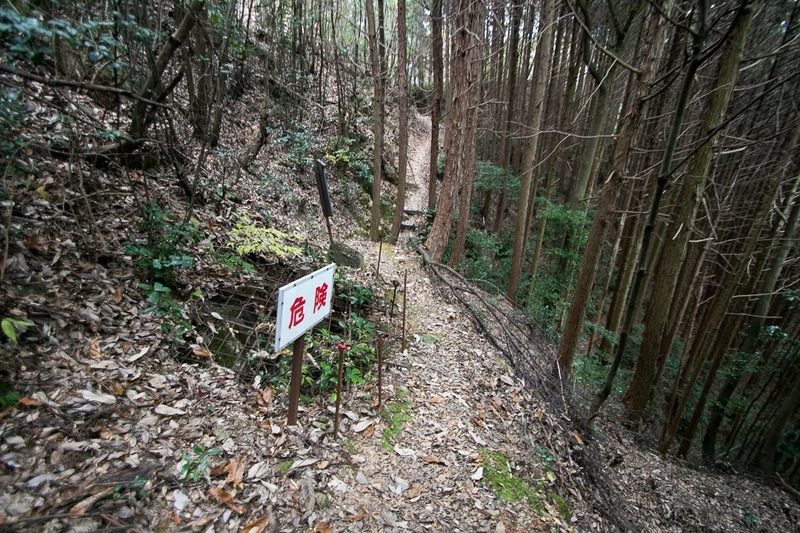 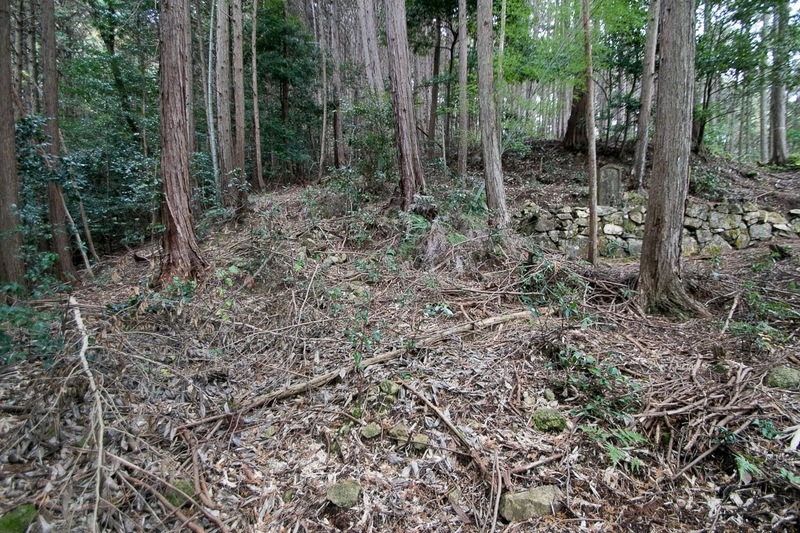 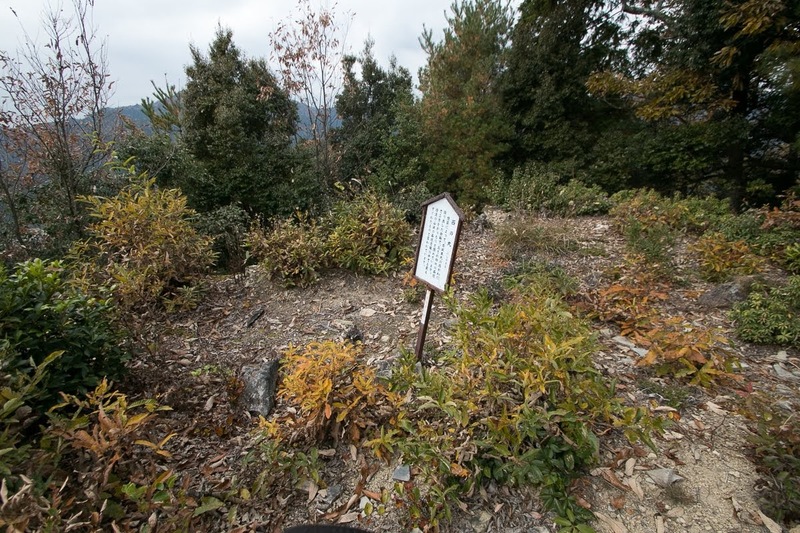 Castle site is an important point to enter Hikami basin from southward, and also connected to another road from Himeji area to Toyooka area by mountainous road. 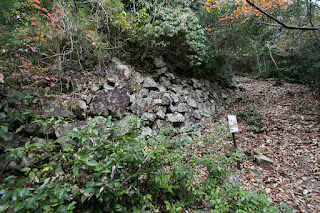 It it said that Iwao castle was originally built by local lord Hitoyori Wada (?-?) 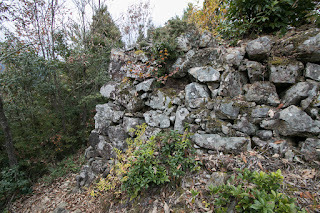 in 1516. 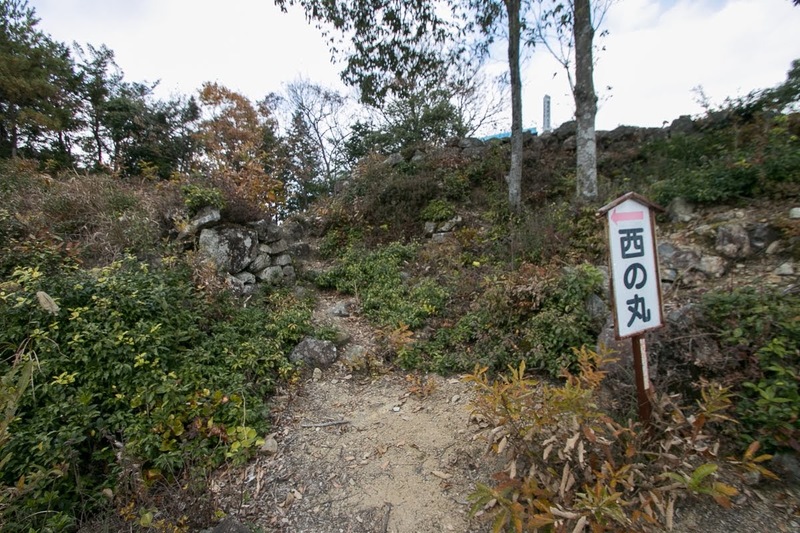 It is said that Wada clan was originally the local lord of Shinano province (Nagano prefecture), and moved to Yamanami area in the latter half of 15th century. 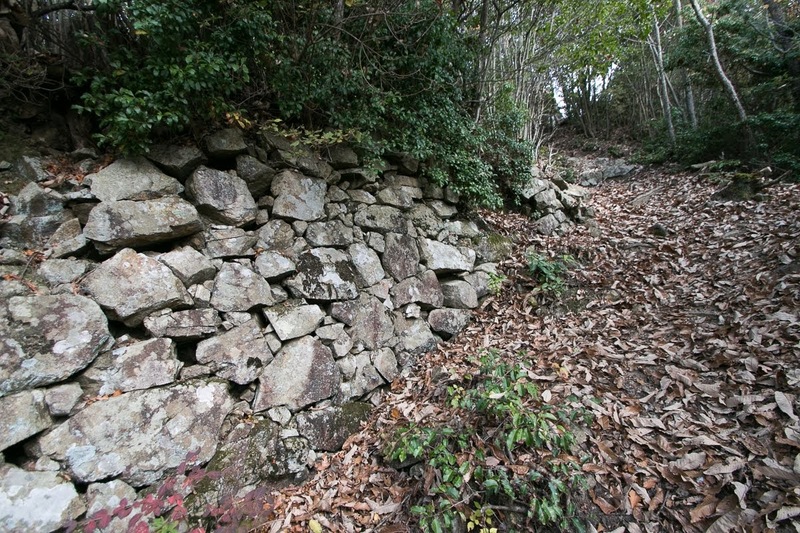 Wada clan governed this area over about 100 years, having relationship to Akai clan which was the lord of Kuroi castle (Hyogo prefecture). But in 1579, Mitsuhide Akechi (1521-1583), the commander of central ruler Nobunaga Oda (1534-1582), intruded into Tanba province (west part of Kyoto prefecture and middle east part of Hyogo prefecture). Mitsuhide ruined Hatano clan at Yagami castle (Kyoto prefecture) then fell Kuroi castle. At this time Iwao castle was also attacked by Akechi army and Wada clan was ruined. 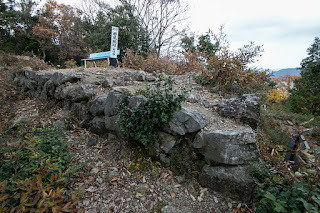 Mitsuhide Akechi became the lord of Tanba province, and Iwao castle might be controlled by Toshimitsu Saito (1534-1582) who became the commander of Kuroi castle. 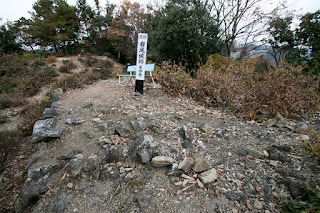 But in 1582, Mitsuhide made a coup d'etat against his master Nobunaga Oda and forced him to suicide, but later was broken by another general Hideyoshi Hashiba (1537-1598, later Hideyoshi Toyotomi) in the battle of Yamazaki and was killed. After the ruin of Akechi clan, Tanba province became the territory of Hideyoshi. 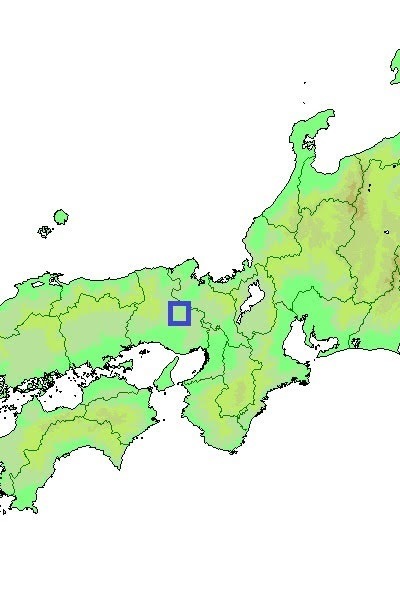 Hideyoshi was a regional commander of Chugoku region under Nobunaga, and current Hyogo prefecture was his main territory. To keep the route from his substantial main base Himeji castle toward Sea of Japan side, Hideyoshi placed his relative or close retainer at Kuroi castle and Fukuchiyama castle on this line. Iwao castle was also an important point to watch and manage this route at the border of Tanba province and Harima province (southwestern part of Hyogo prefecture). 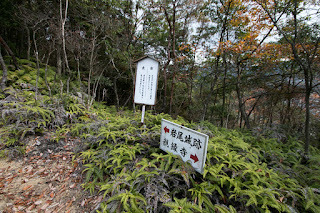 Hideyoshi placed Hidekata Sano (?-?) 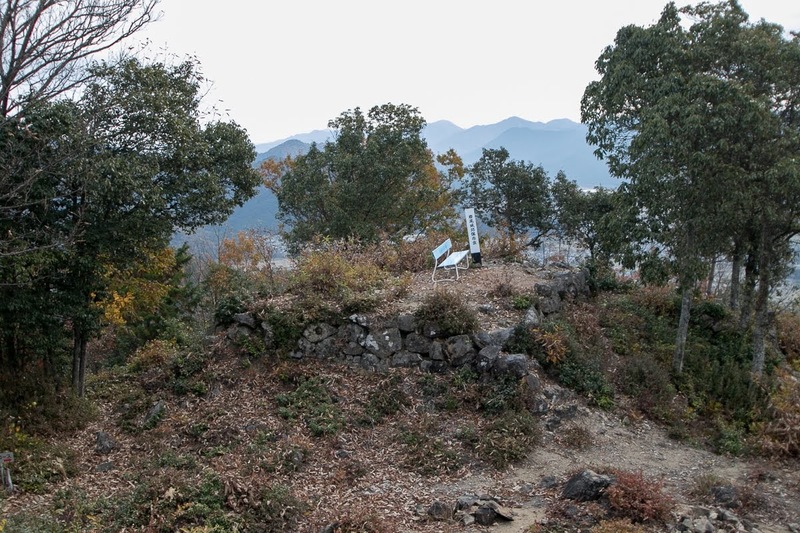 as the lord of Iwao castle, even with small territory. Hidekata was originally a head of monk soldiers at Kido castle (Shiga prefecture) and fought against Nobunaga Oda, but was defeated and once hided. 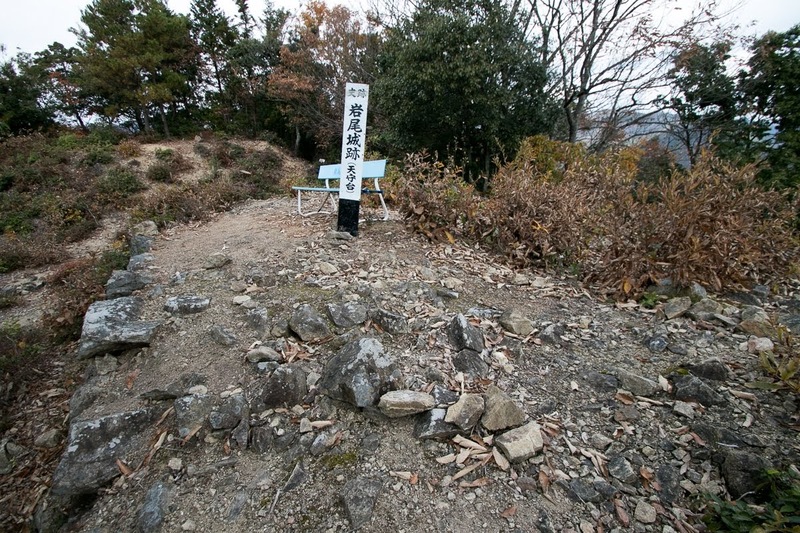 Later Hidekata served to Hideyoshi and became a lord. Considering an importance of Iwao castle, Hideyoshi might support Sano clan to renovate Iwao castle into modern one. 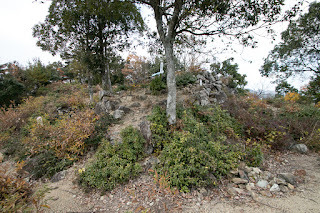 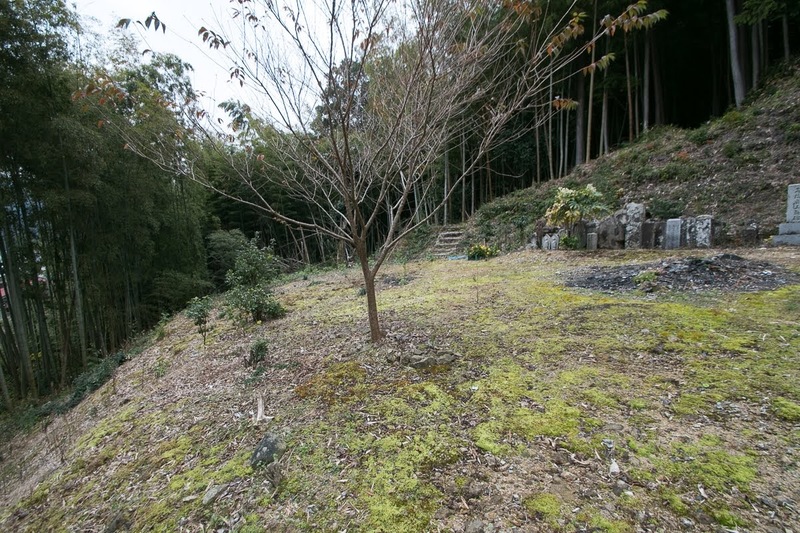 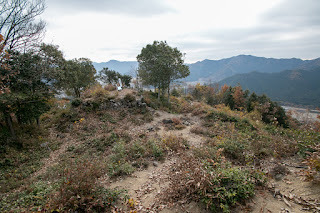 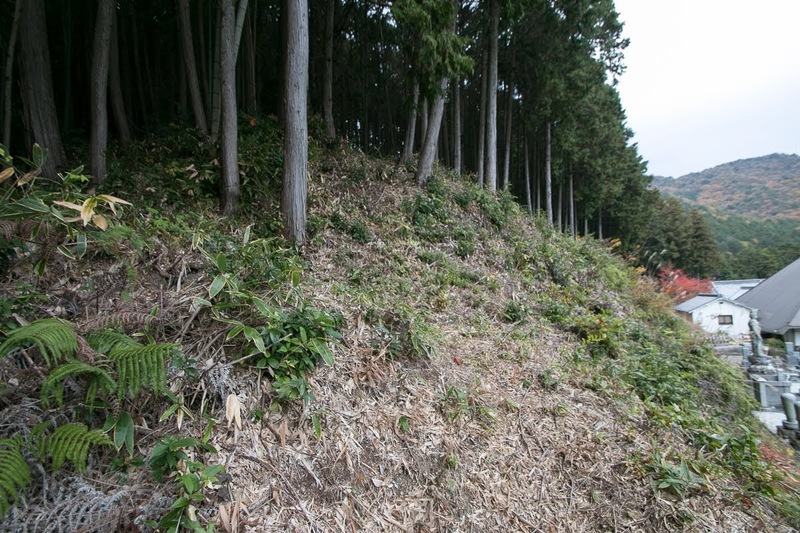 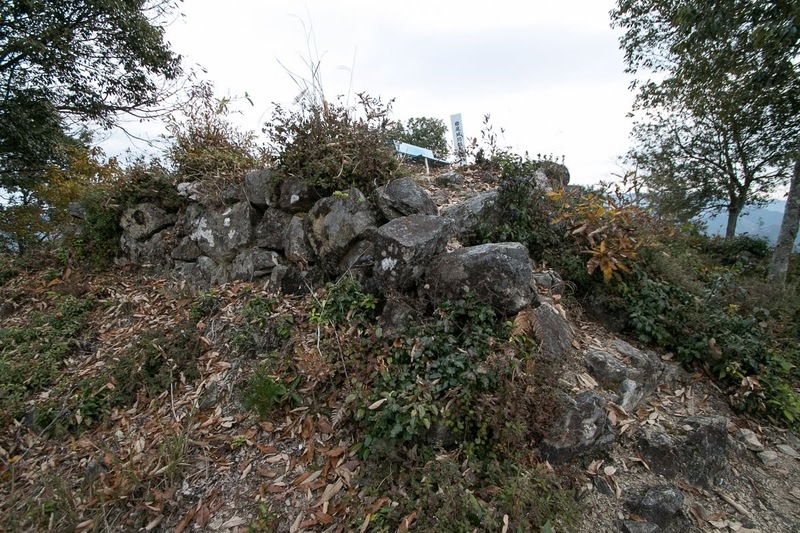 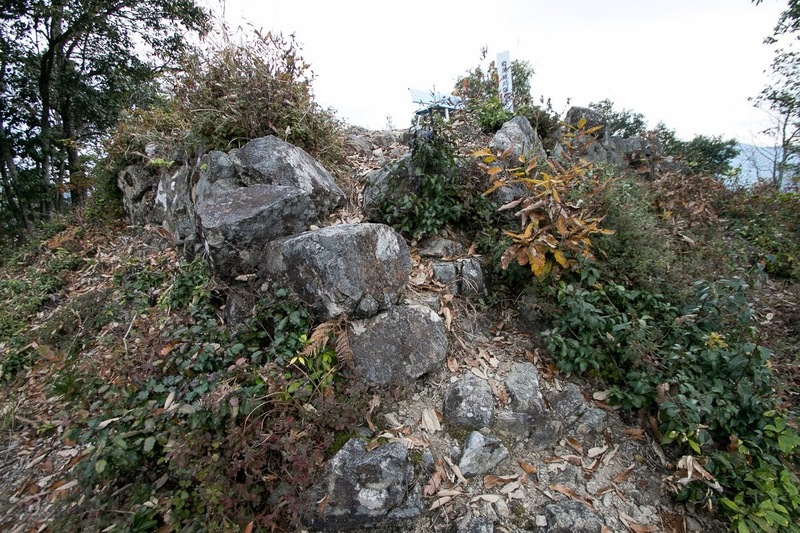 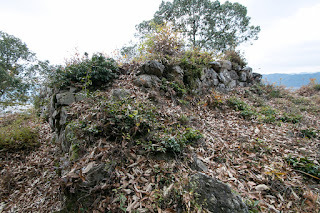 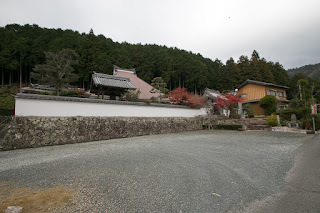 Iwao castle consist of hilltop area and terraces spread along with the ridge. 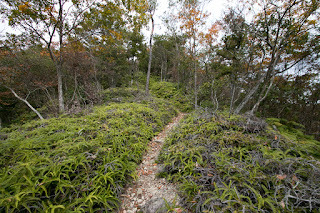 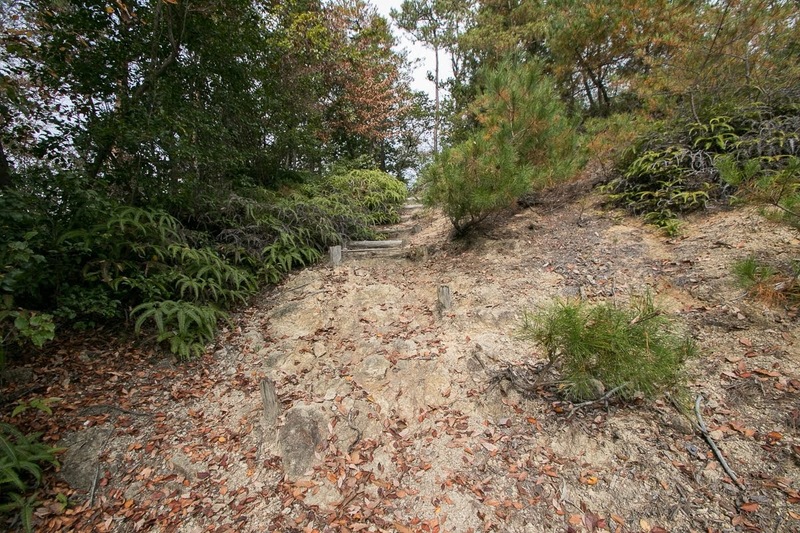 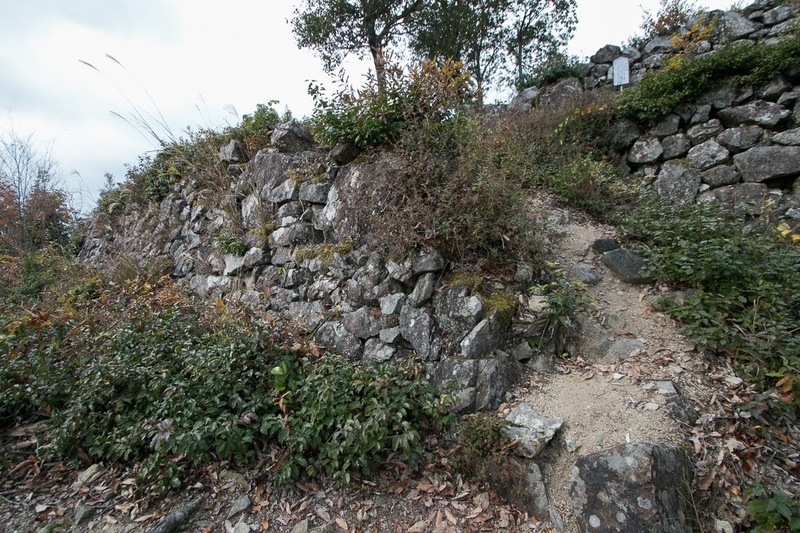 Hilltop area was originally a long and narrow area of about 80 meter long and 20 meter width separated into north half and south half by narrow height at its center. 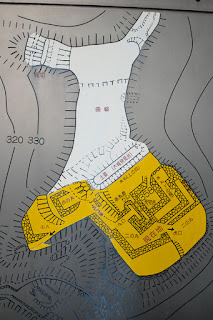 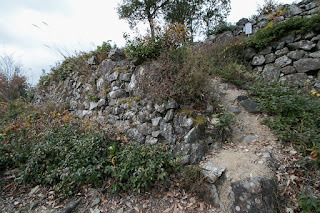 But after the fall of Wada clan, north half of hilltop area was abandoned and only south half faces hillside area and castle town was reformed into modern castle. 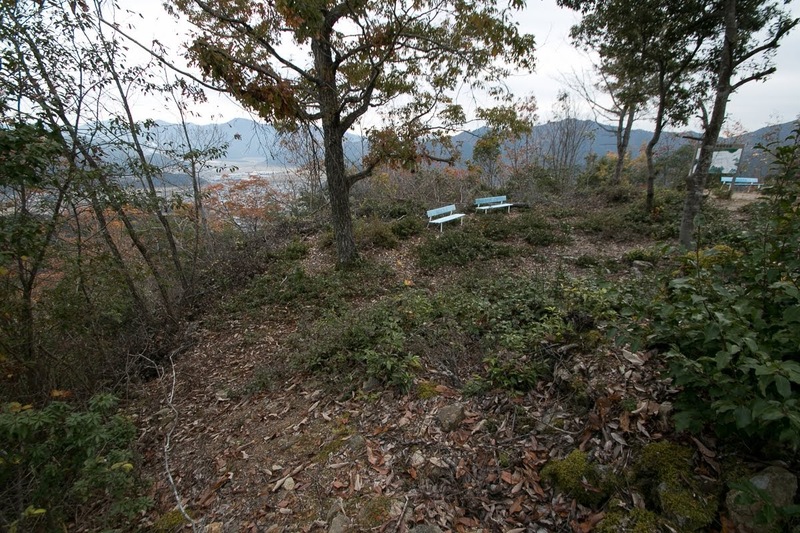 At the center of south half there is a small main tower basement of 9 meter long and 6 meter wide, and two floor small tower might exist there. 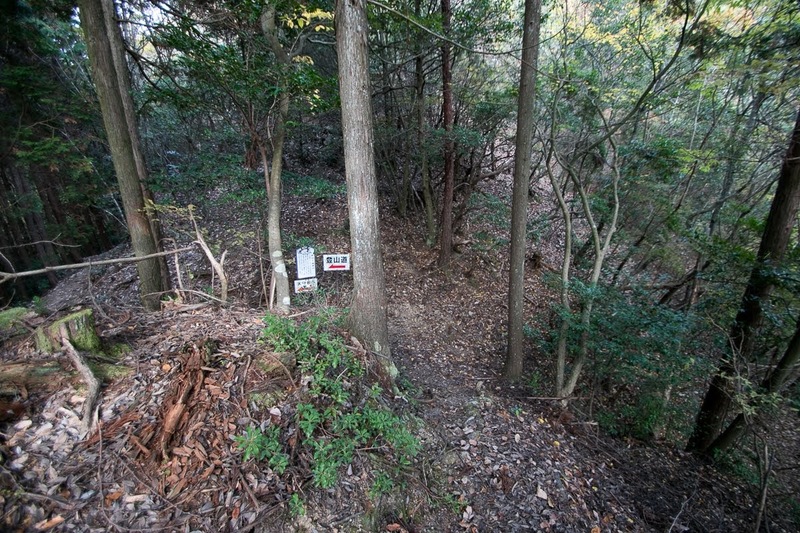 Central area is a 20 meter long square area surrounding main tower basement, and has composite gate at its west side. 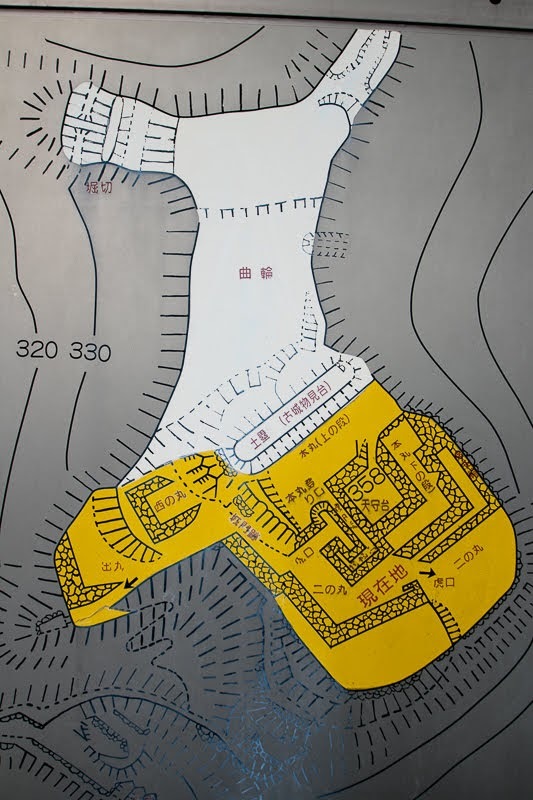 Secondary area covers southern and western line of the central area like a corridor, and has its gate at its south part and northwest corner. 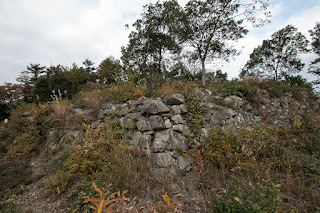 As several layers of stone walls was built at narrow hilltop area and there existed relatively large main tower compared with the size of the area, it might look like a Ziggurat of middle eastern area. 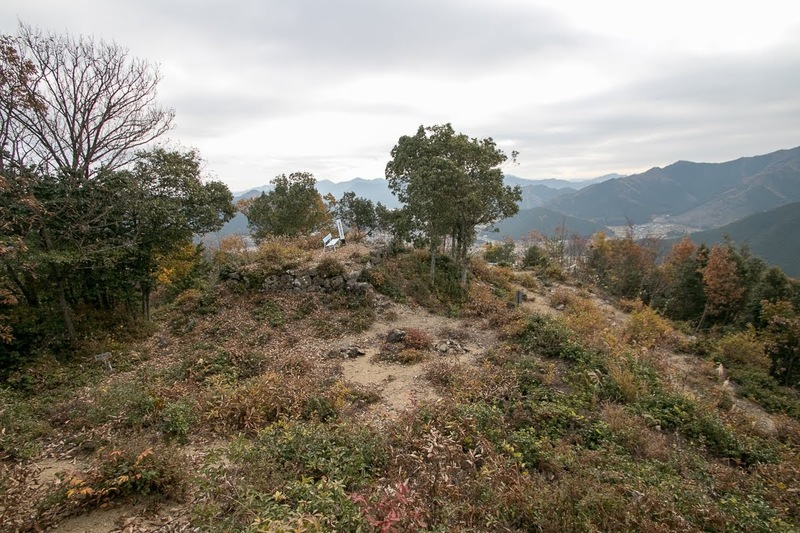 Hilltop area is a connecting point of four ridges spreads each direction like a cross, and its appearance looks closer to religious place than a castle. Even though a small castle, but hilltop area is mostly covered by stone walls of two types. 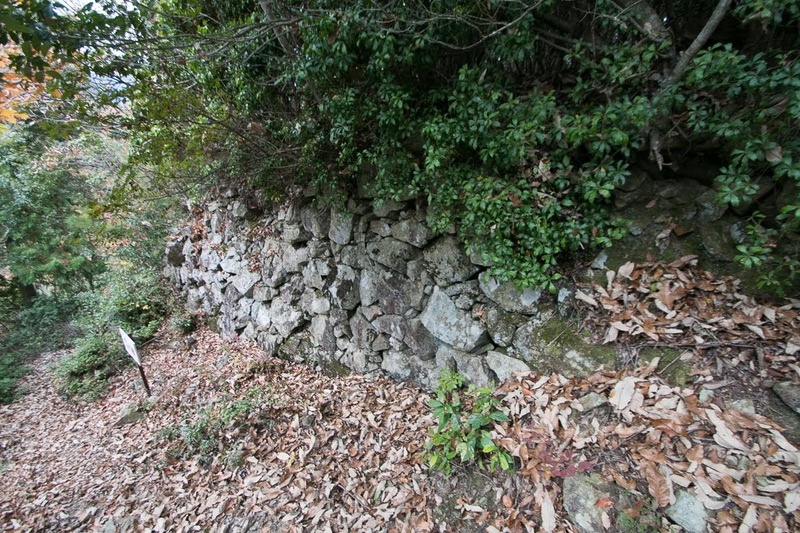 Stone walls of central area and secondary area are not so high and built using same size round stones, without clear corner structure. 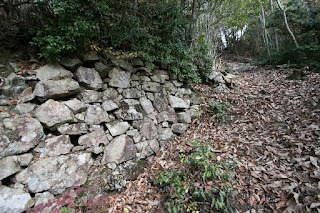 This style of stone walls might be built former in 1580's. 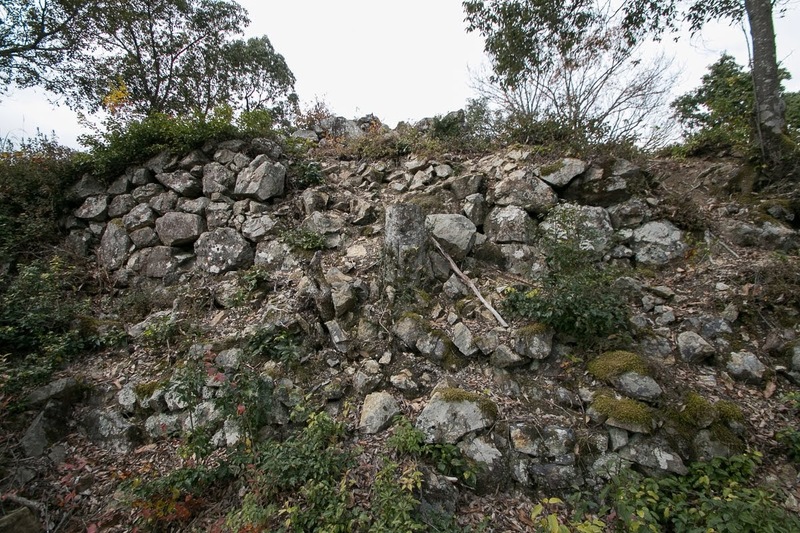 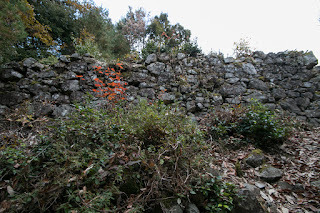 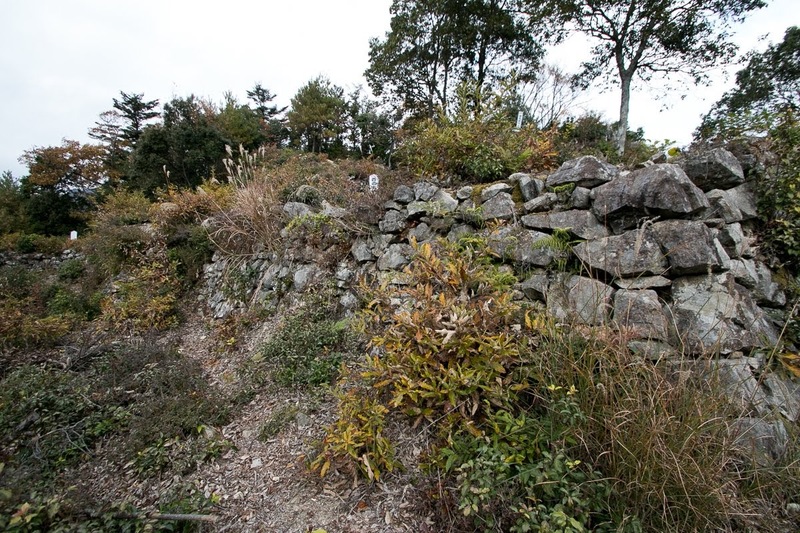 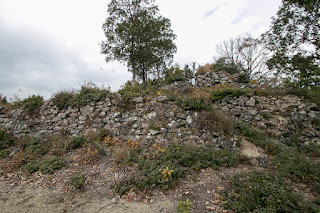 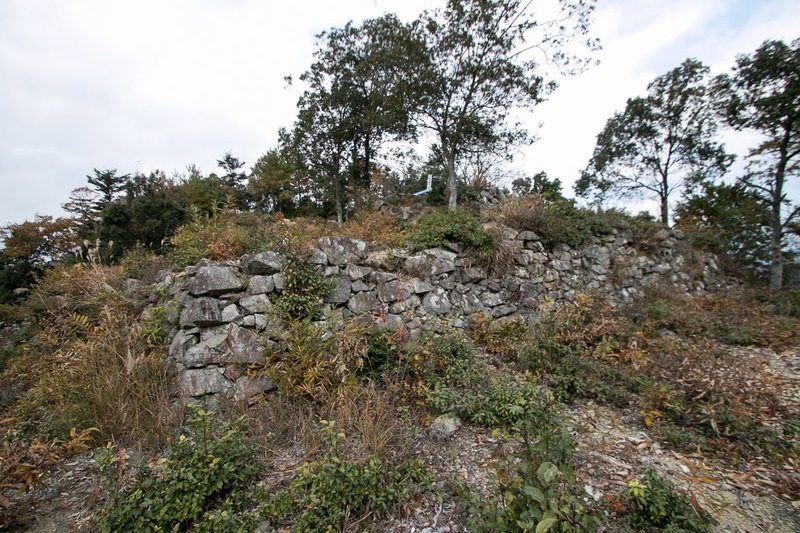 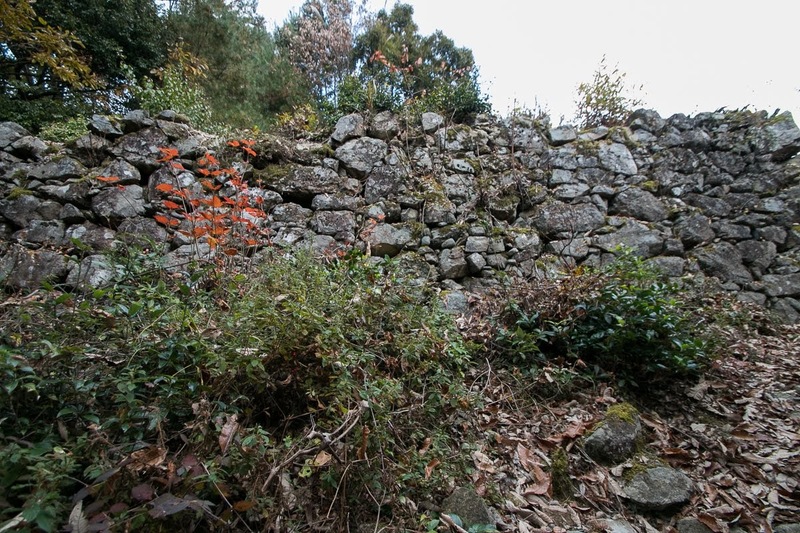 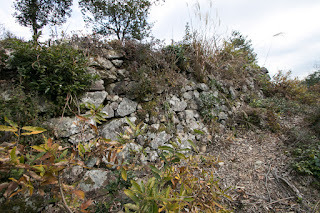 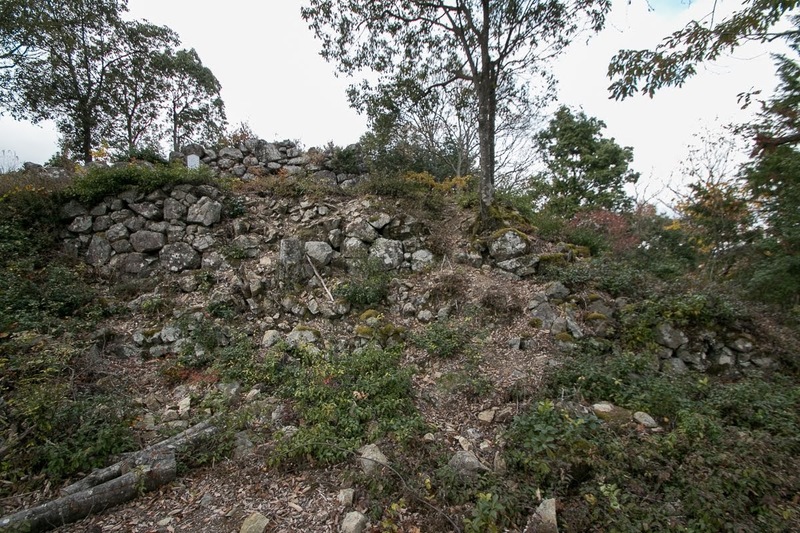 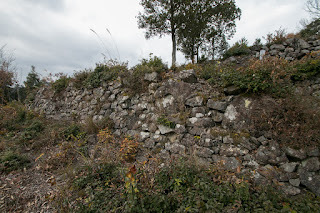 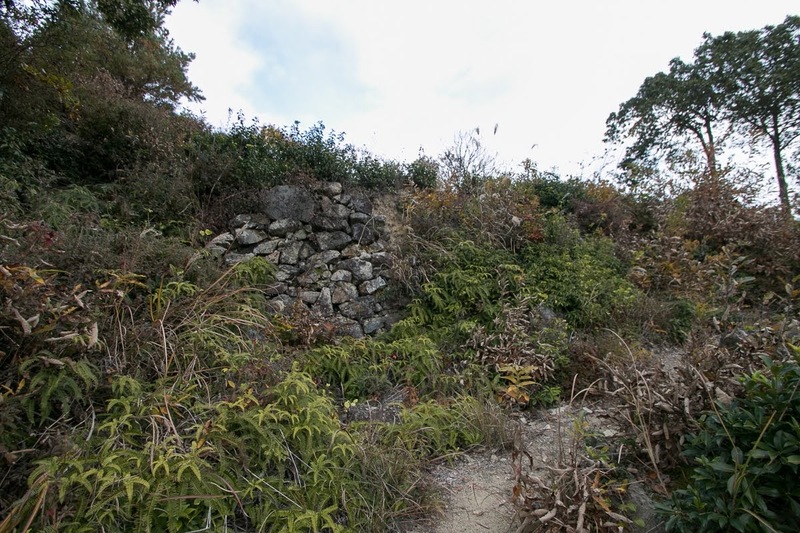 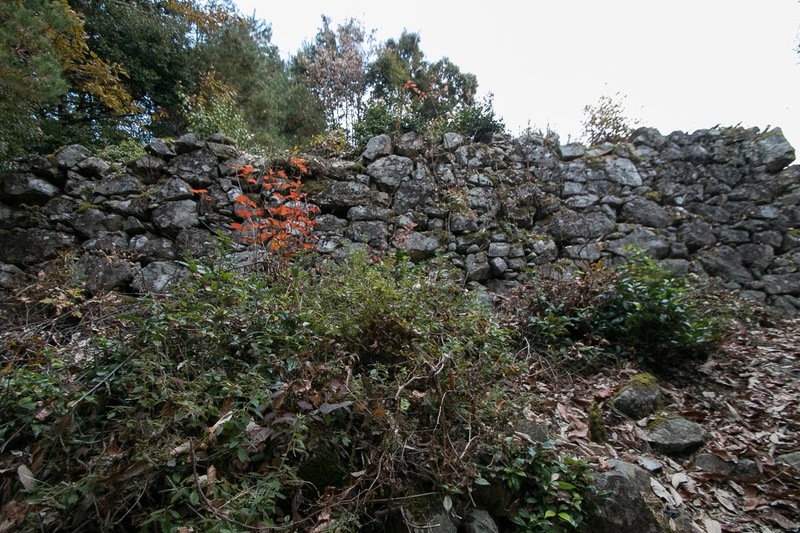 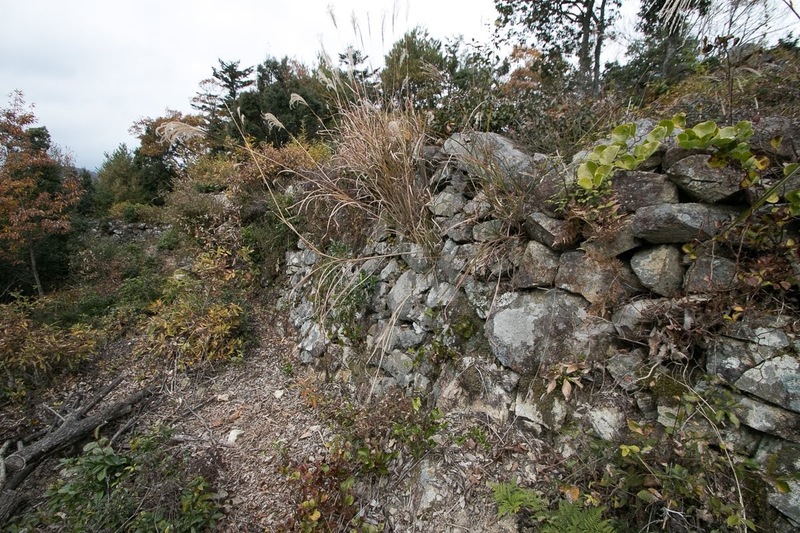 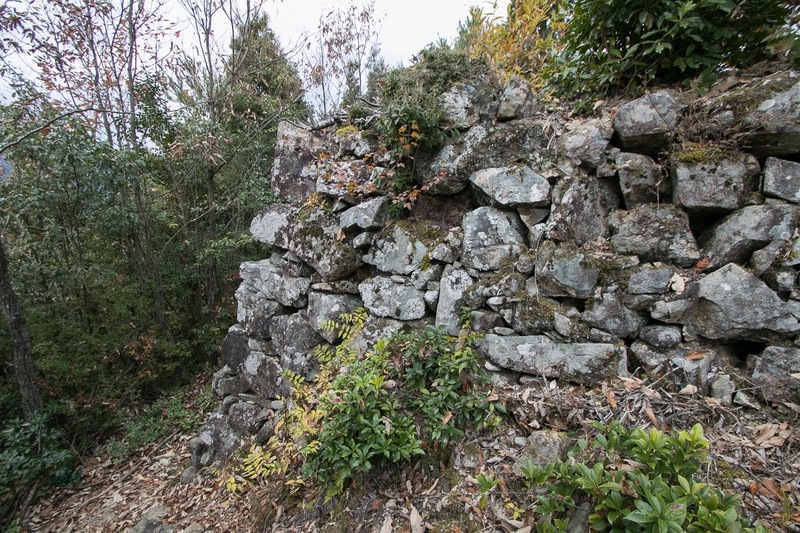 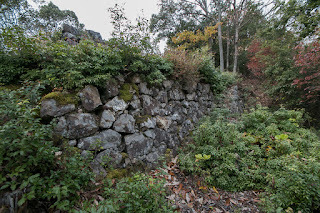 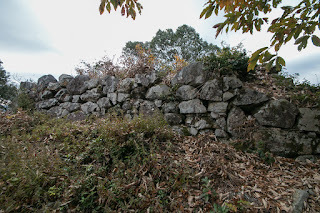 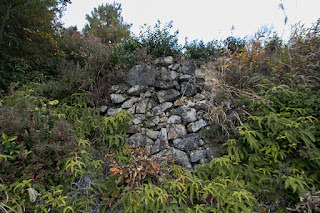 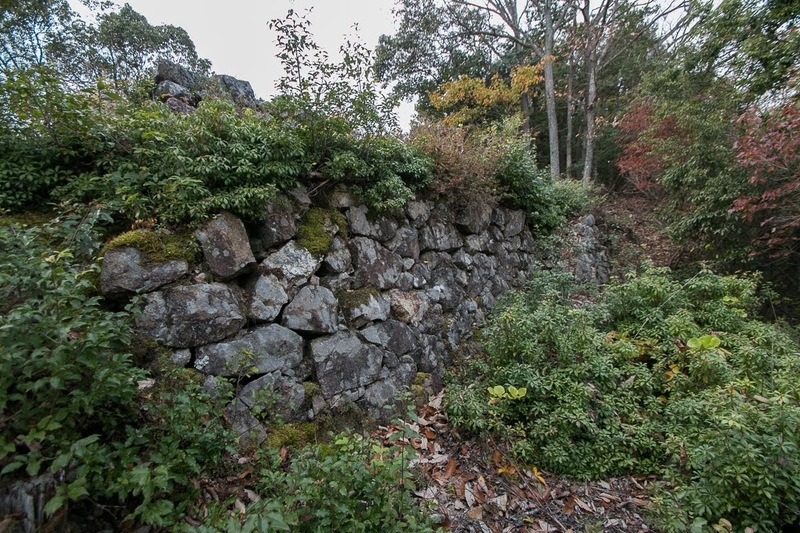 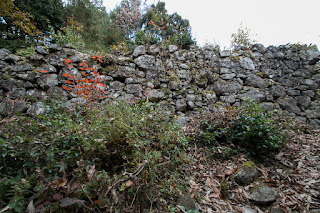 On the other hand, stone wall of main tower basement or front wall Nishinomaru area where is the main gate of the castle are tall and built by largeer stones. 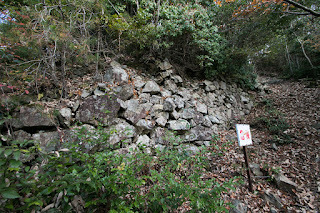 Furthermore there are clear corner structure named "Sangizumi", the way to place rectangular solid stone alternately at 90 degree different direction, like a Jenga toy. 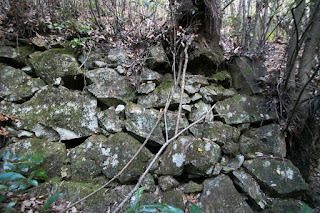 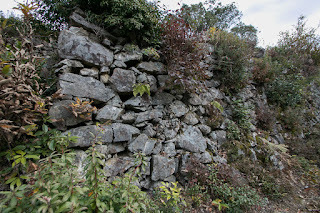 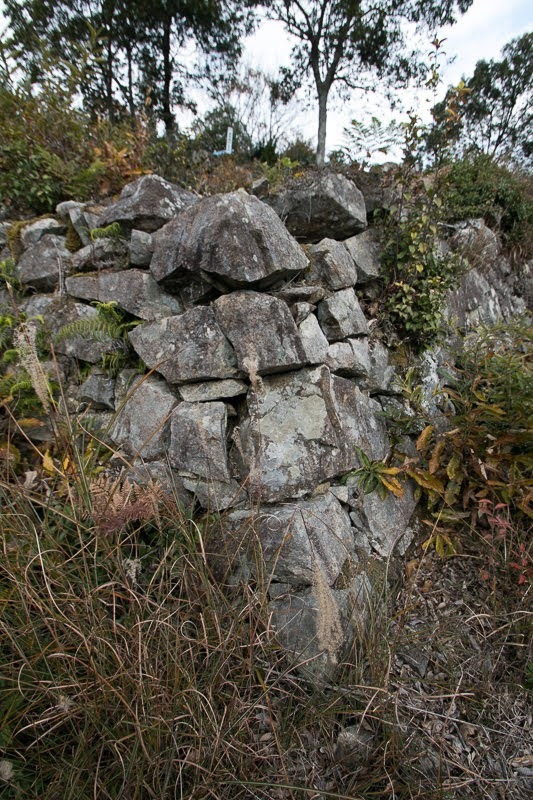 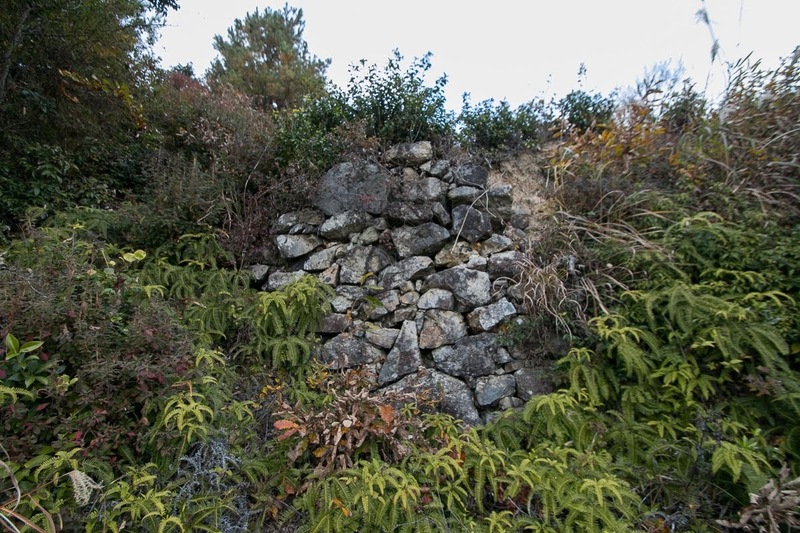 This structure is a newly developed method to prevent corruption of stone wall, and seen at stone walls in 1590's. 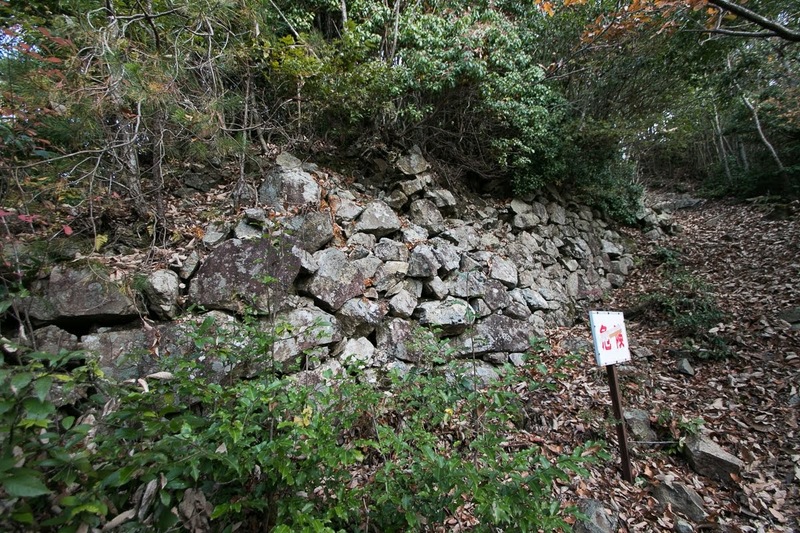 It is thought that at first Sano clan built low stone walls of outer area to strengthen this castle as a border fortress. 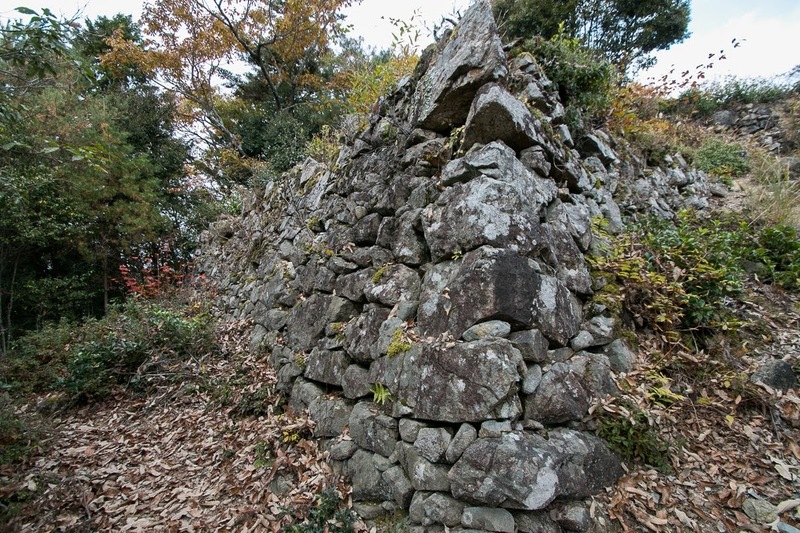 Later Sano clan built added main tower basement and front gate wall to show it authority as a lord. In 1590, Hideyoshi ruined Hojo clan and united whole part of Japan. 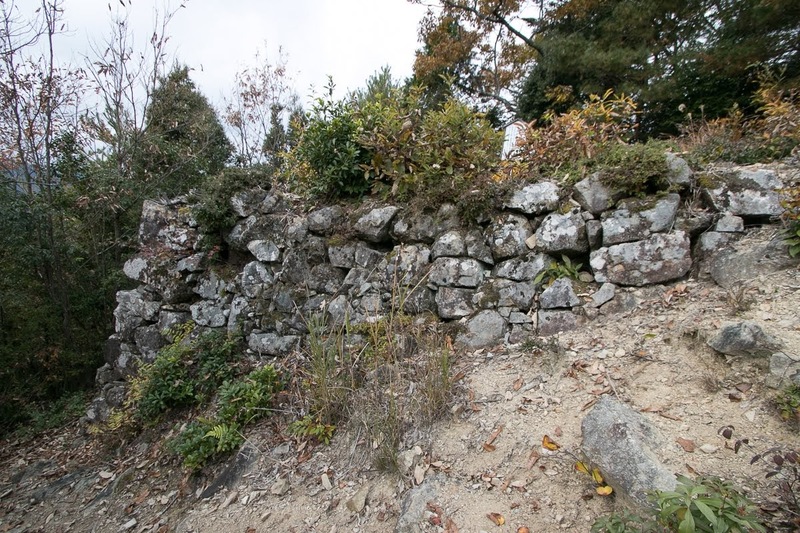 To save management costs and prevent from usage in rebellion, Hideyoshi ordered to scrap small castles. Besides, Iwao castle became too small to resist against larger and stronger armies. 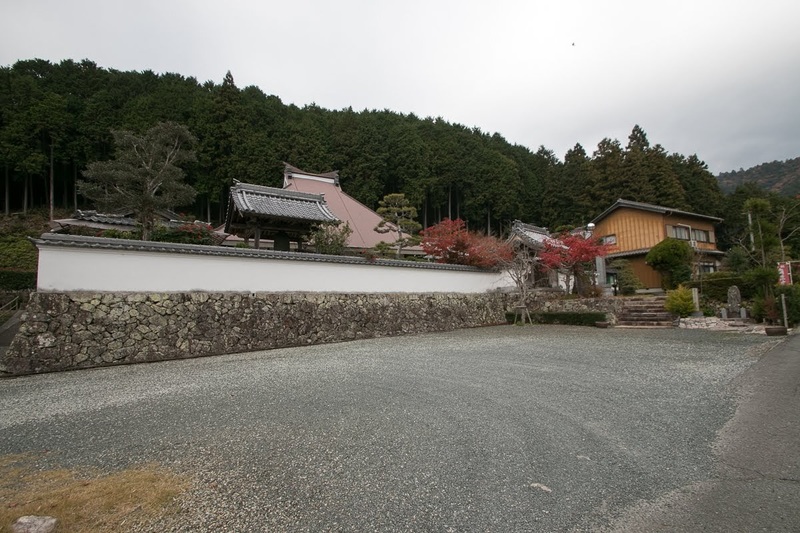 In 1596, Sano clan moved to his original territory Omi province, and Iwao castle became the territory of Geni Maeda (1539-1602), one of five magistrates of Toyotomi government and lord of Tanba Kameyama castle (Kyoto prefecture). 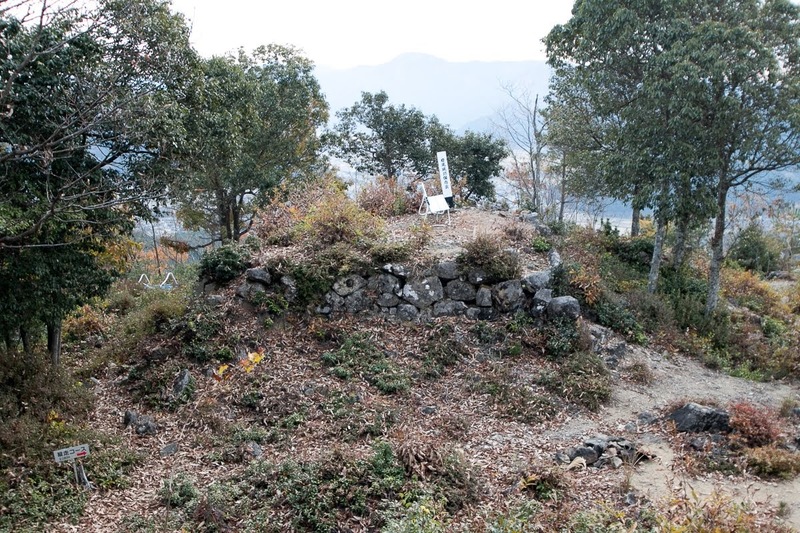 But at this point Iwao castle was abolished. 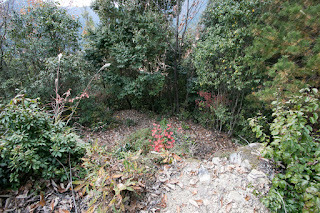 Now all building was lost but half broken stone walls still remain at the peak of the mountain. 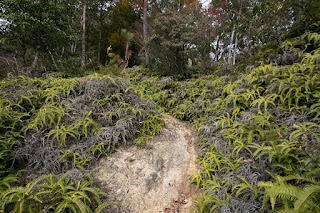 Height difference between hillside area and hilltop area is nearly 300 meter and it is a bit tough to climb to the castle. 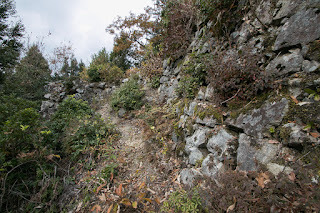 But layers of stone walls crammed into narrow hilltop area is an interesting view not seen in other castles. 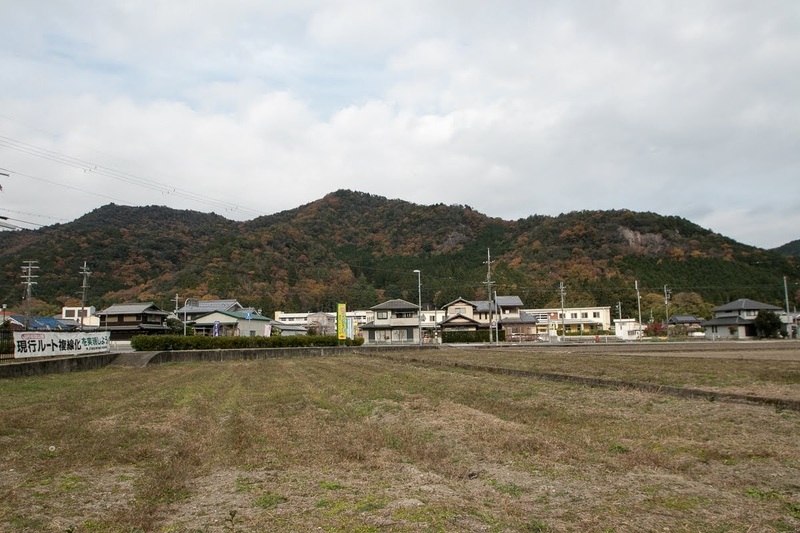 20 minutes drive from Kita-Kinki Toyooka Jidoshado Expressway Hikami interchange. 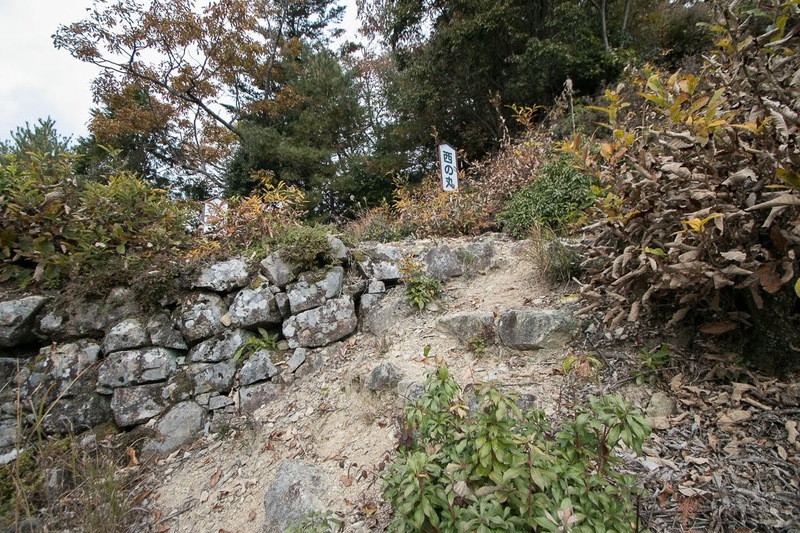 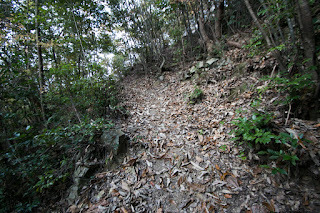 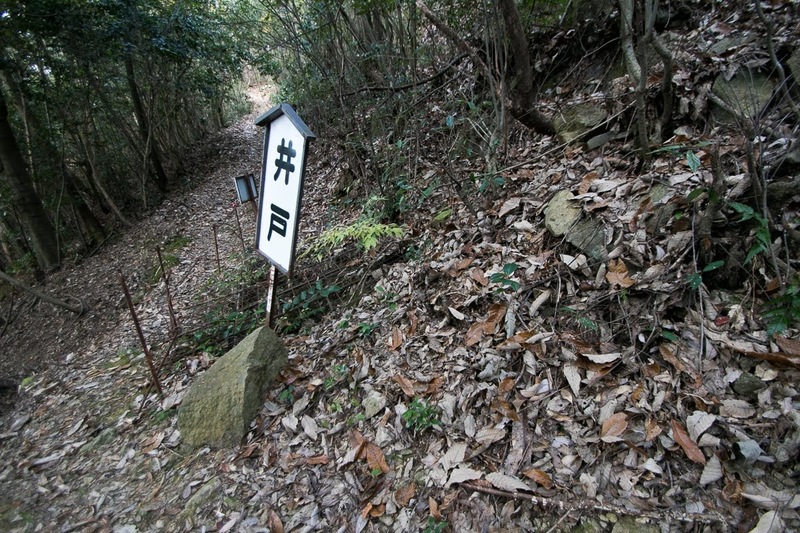 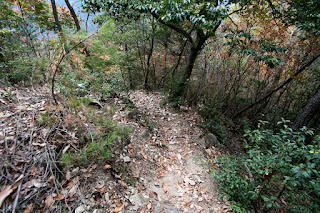 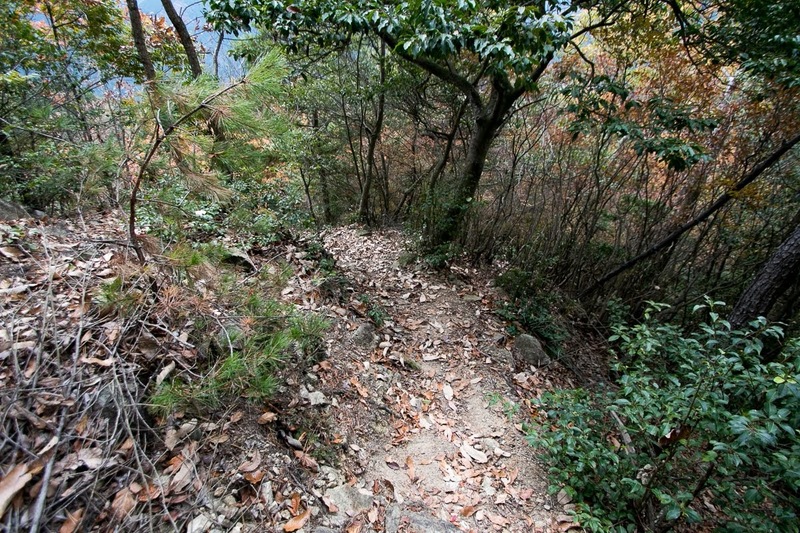 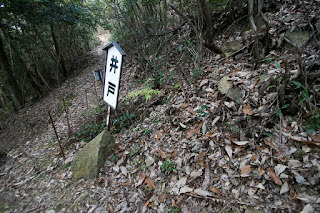 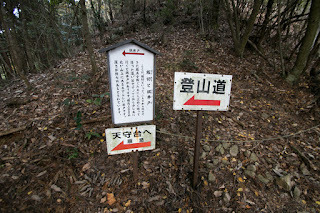 Entrance of climbing road is at the behind of Shinnenji temple of Wada town.